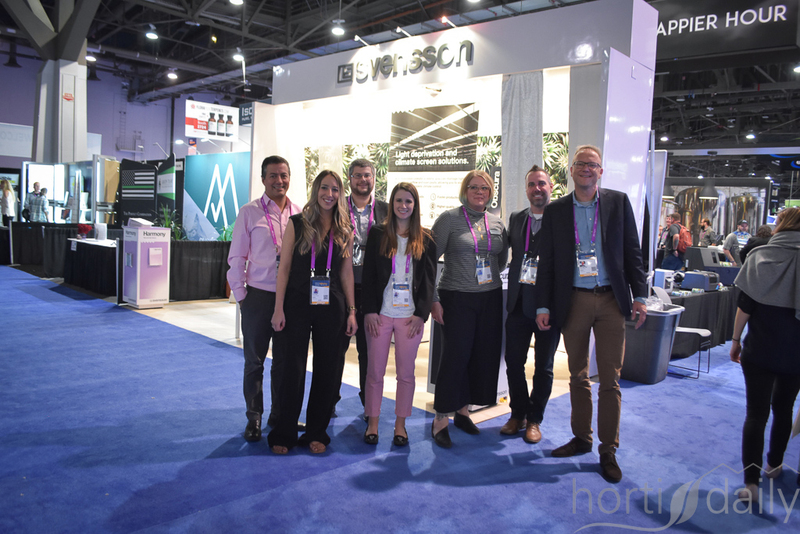 The team with Svensson had a great time at the show. 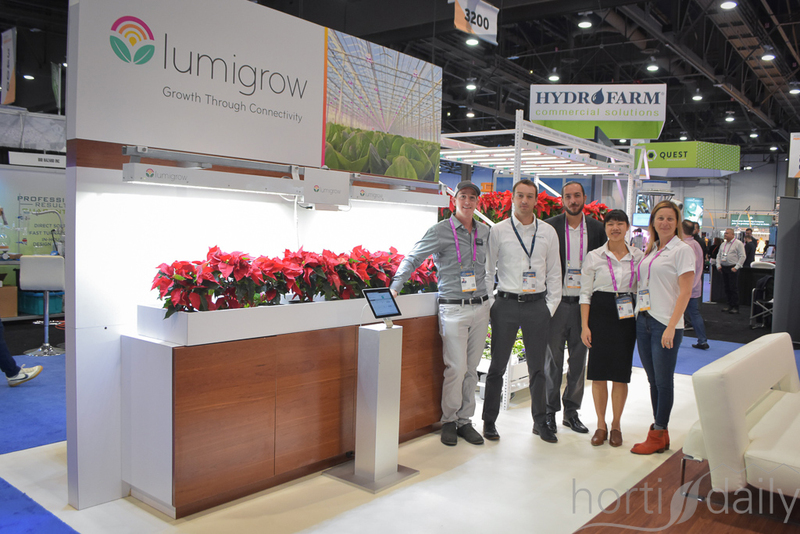 Of course Lumigrow is exhibiting as well. 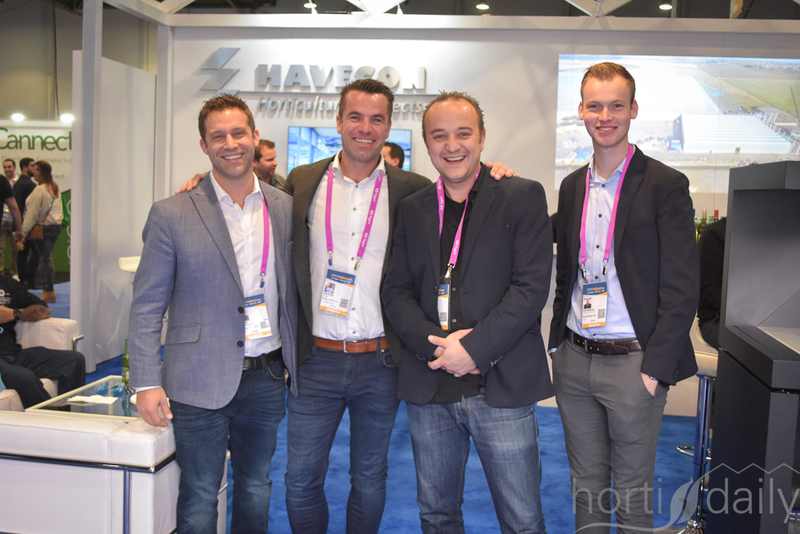 Jon Adams, Henk Verbakel, Adnan Tunovic & Pieter Ammerlaan with Havecon. 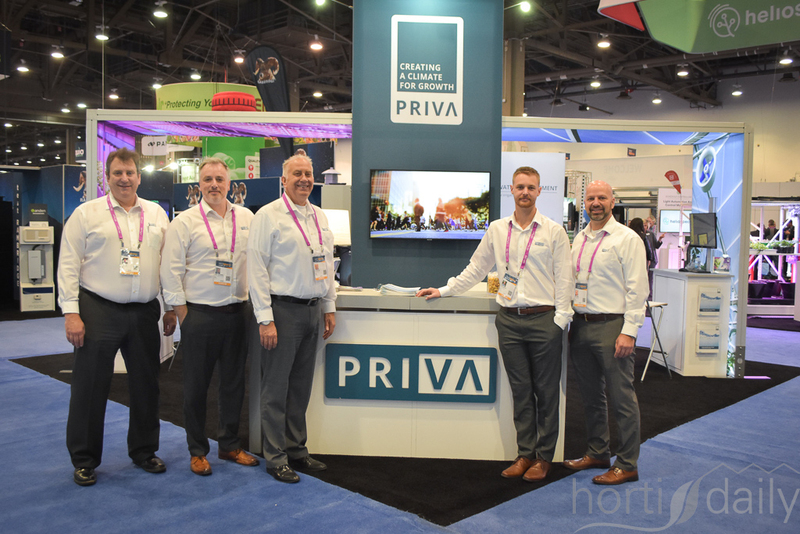 Priva was present at the show. 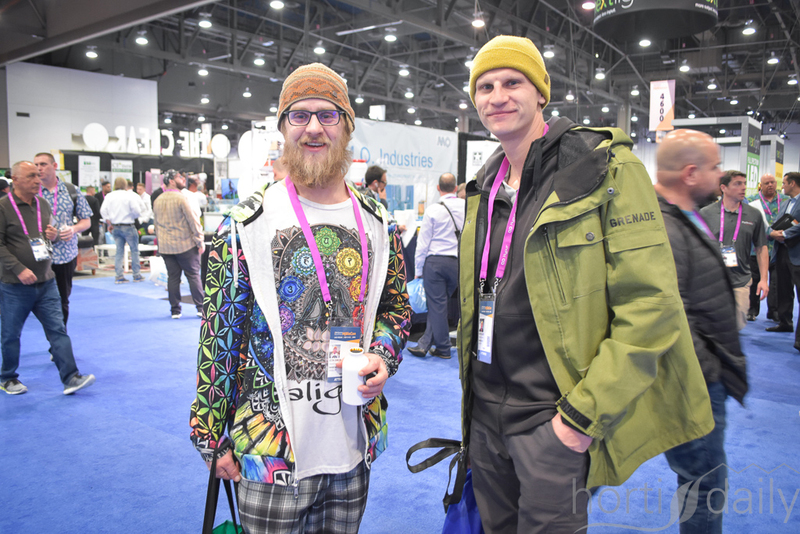 These are the early birds - being there from the moment the doors opened, even on Thursday. 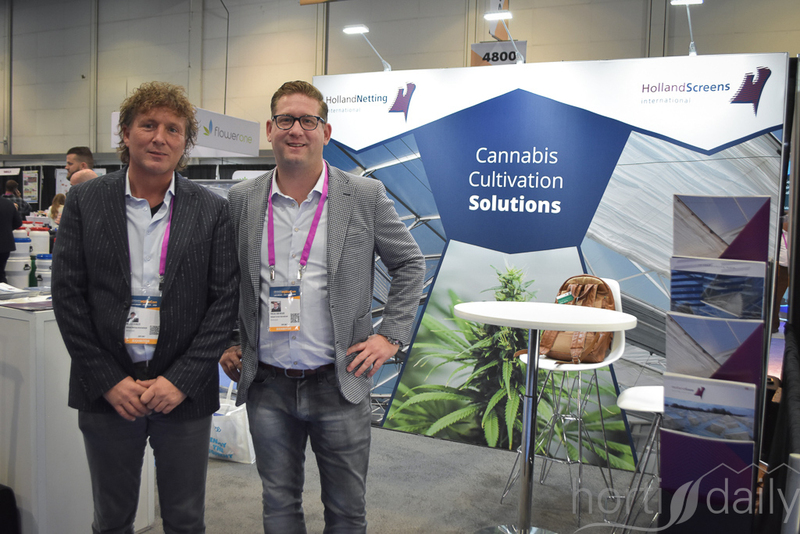 Dutch Horticultural Professionals has it’s base with Nick Mela, who’s offering various supporting methods to growers. 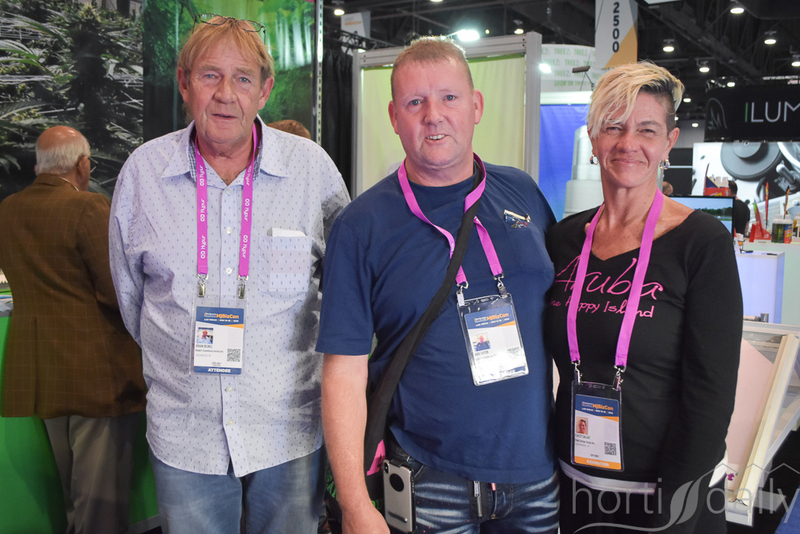 In the photo with Joel Meaney & Debora Mela, his wife. 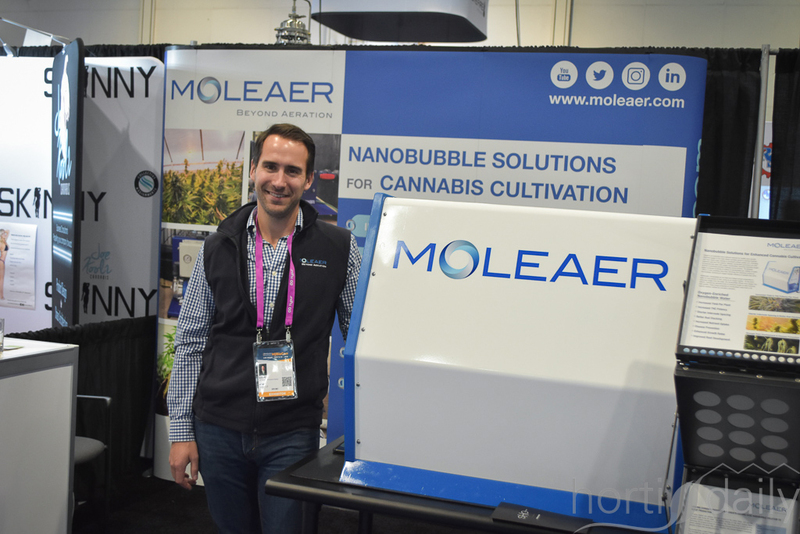 A higher yield thanks to a higher level dissolved oxygen, that's made possible with the Moleaer Nanobubble Generator. 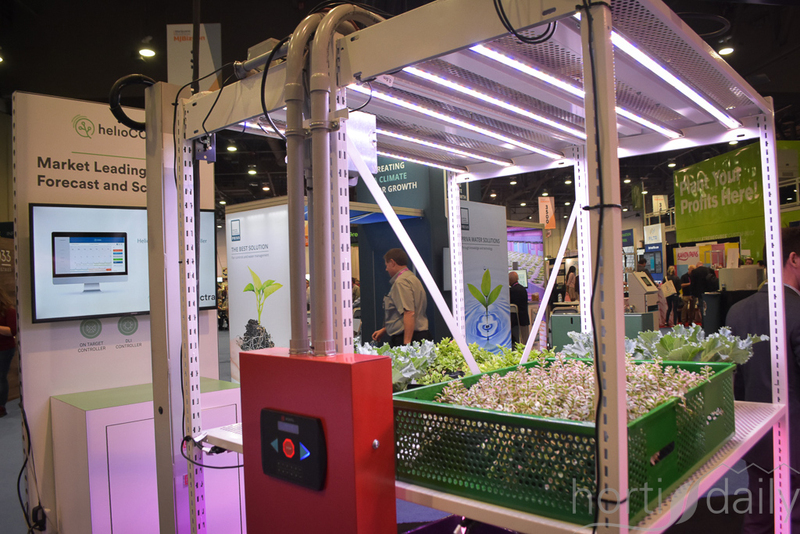 Up for launch next year is the Bloom. 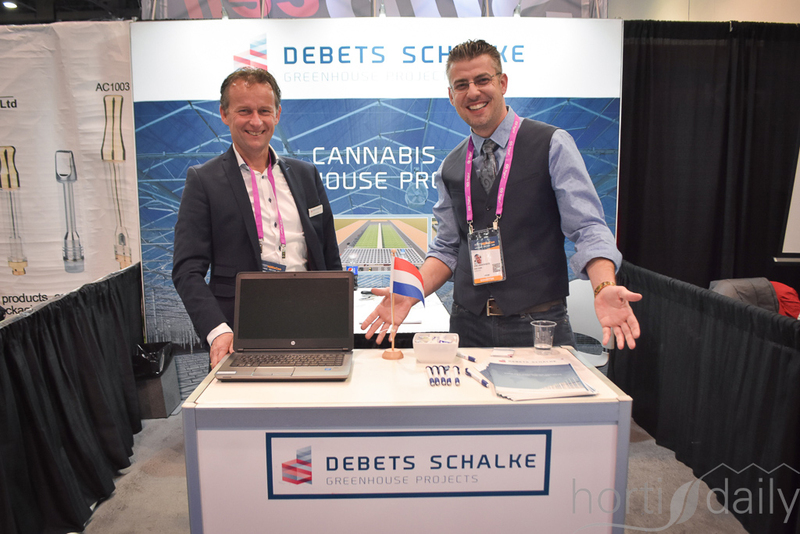 Wim van Weele & George Jordan Panajotoy with Debets Schalke. 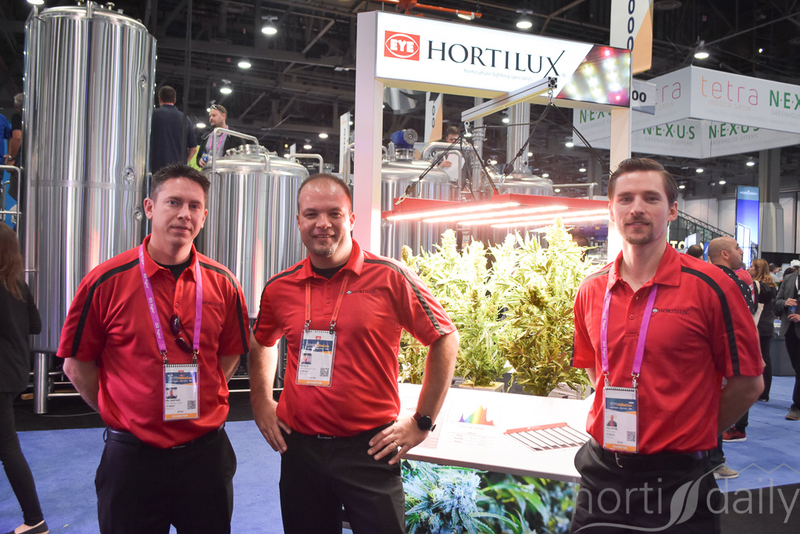 The team of EYE Hortilux: Mike Habbyshaw, Rich Black & Paul Smetona. 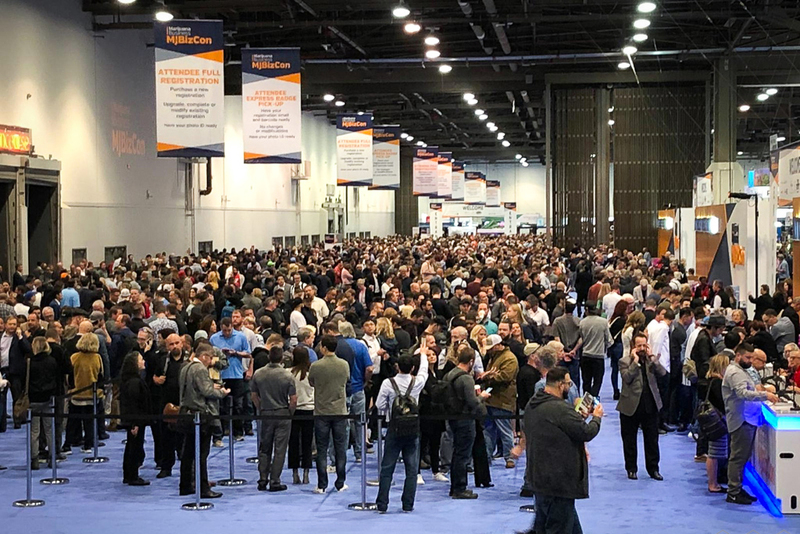 The first day off the exhibition - even though there were various options to pick up badges earlier, the crowd was enormous. 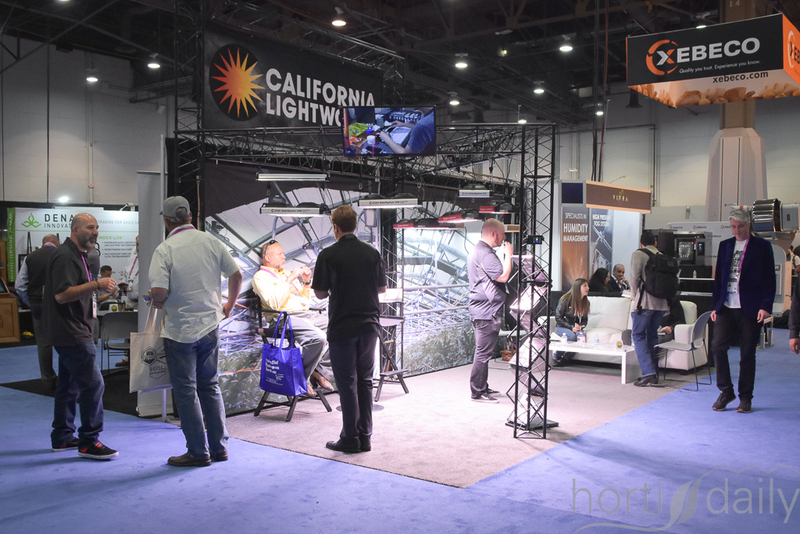 Visitors were in line up to two hours. 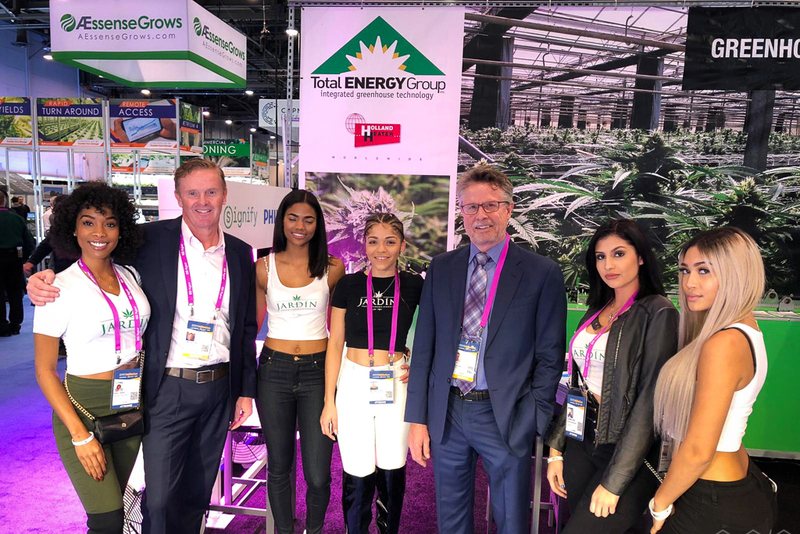 Only part of the team of Total Energy Group was present at the exhibition, whereas there colleagues visited the fair in Irapuato. 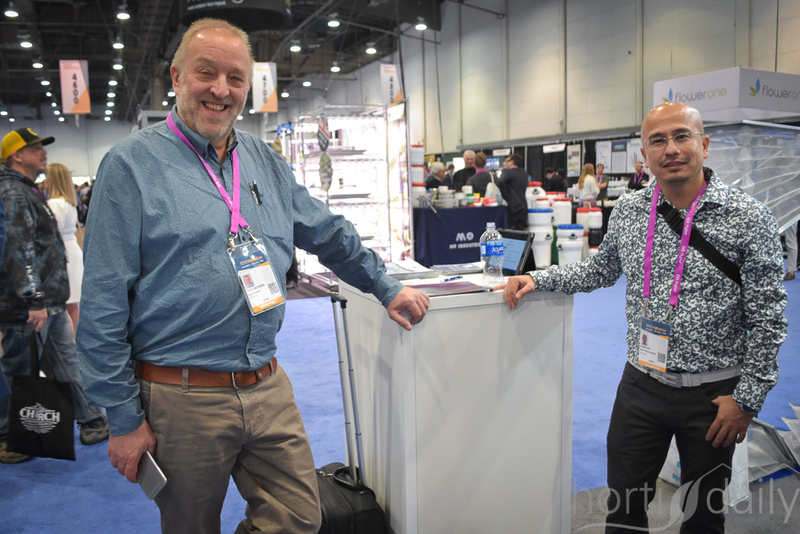 Fortunately Dennis van Alphen didn't have to feel lonely. 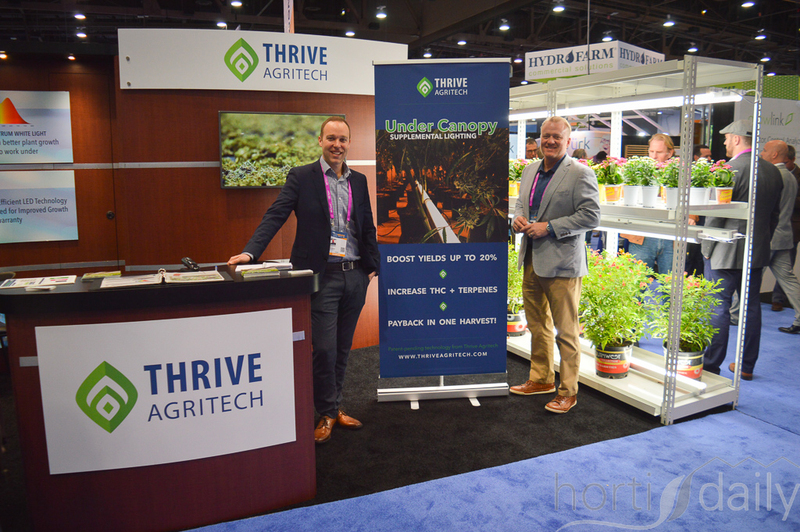 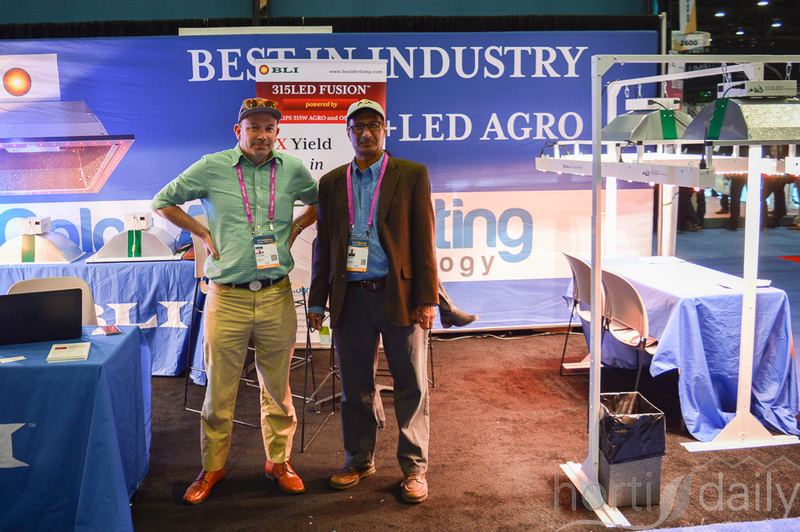 Agrilyst & Vivid-Gro joined the exhibition unitedly. 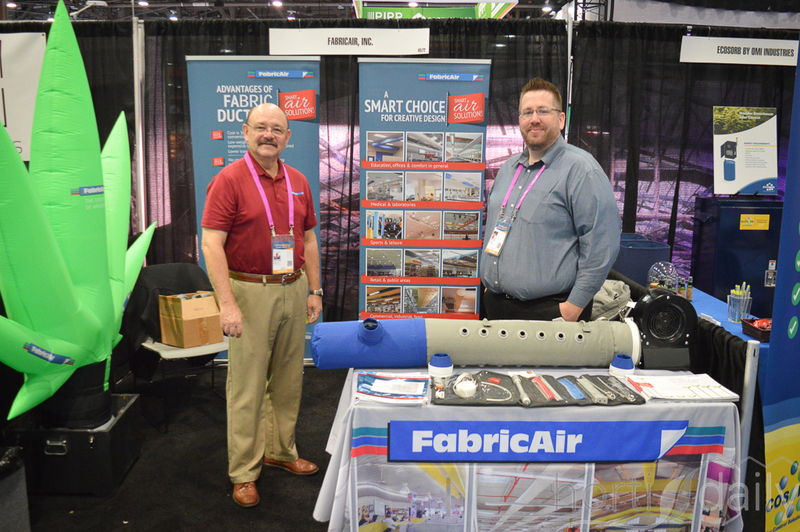 Eric Senecal, Joel Morissette with Damatex. 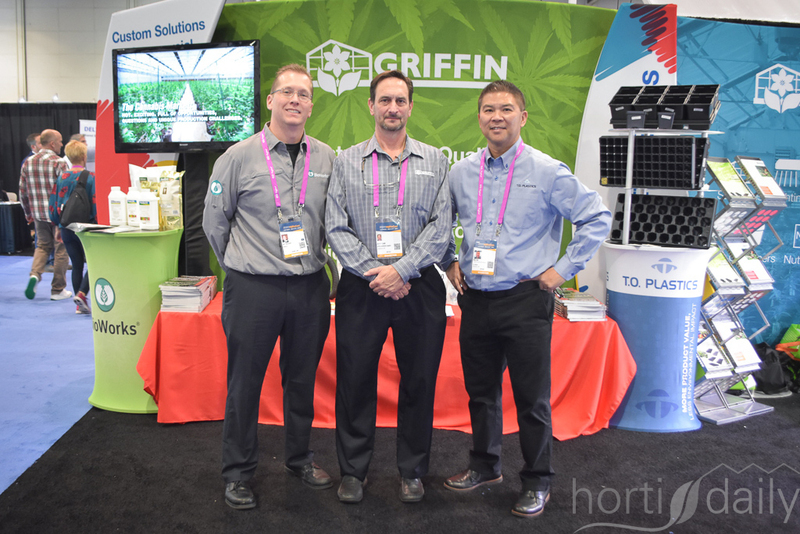 Griffin also invited various suppliers to participate in their booth. 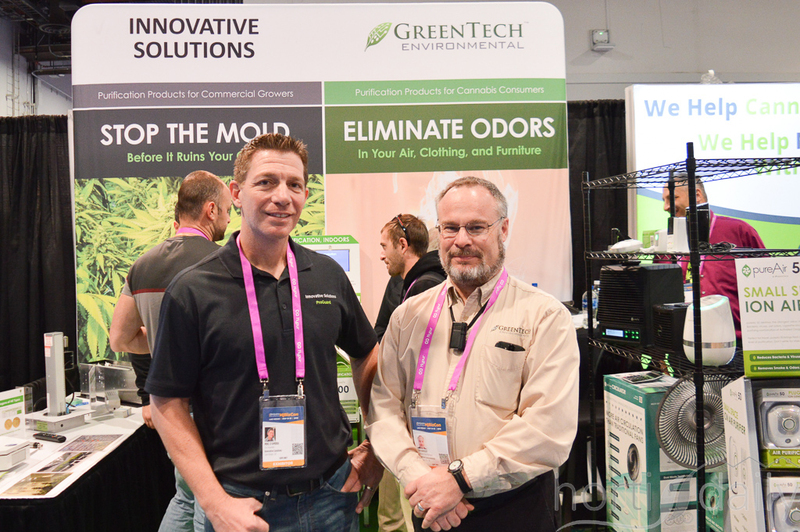 In this photo Matt Needham with Bioworks (left) and Noel Yan with TO Plastics. 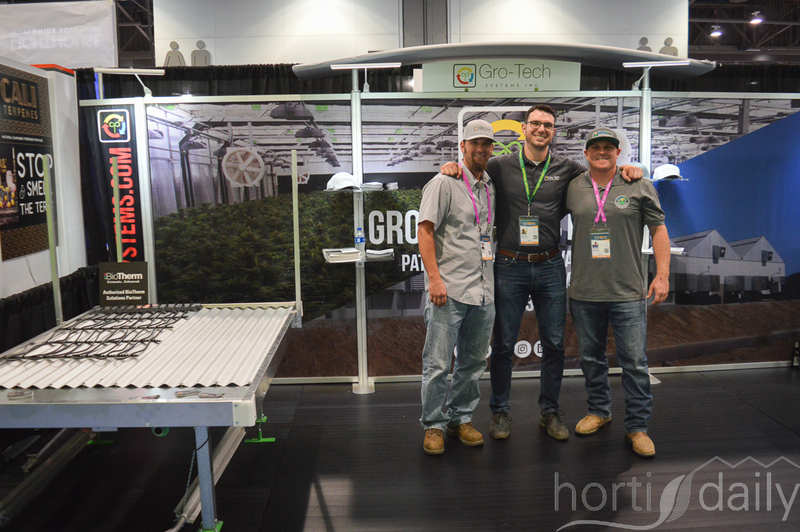 In the middle is Duffey Clark with Griffin. 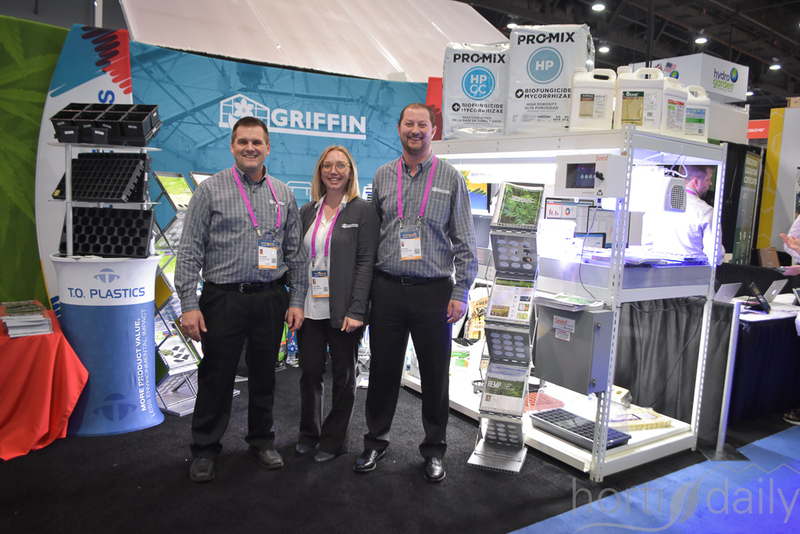 Peter Armando, Jessica Robinson & Chris Filling - the commercial team with Griffin. 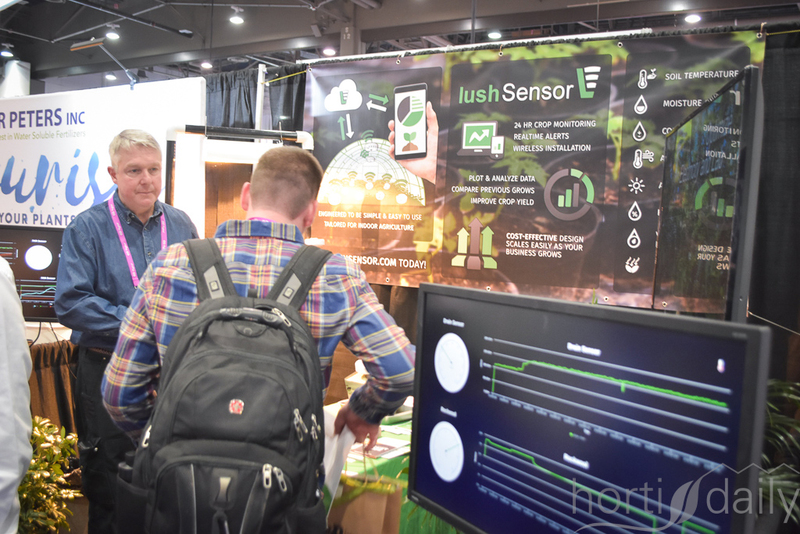 Lush Sensor offers various monitoring options, providing real-time data on the temperature, moisture and salinity to help ensure the soil is always perfect. 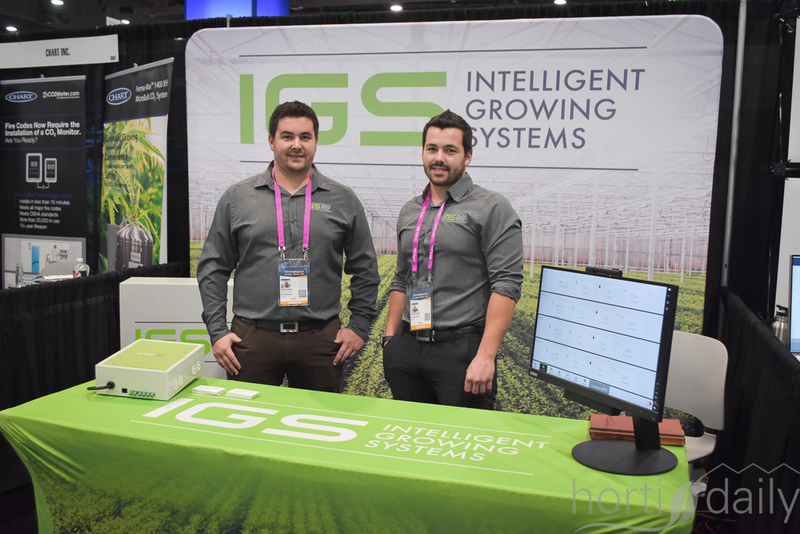 Vincent Bernier & Antoine Bernier with Intelligent Growing Systems, providing solutions to various crops. 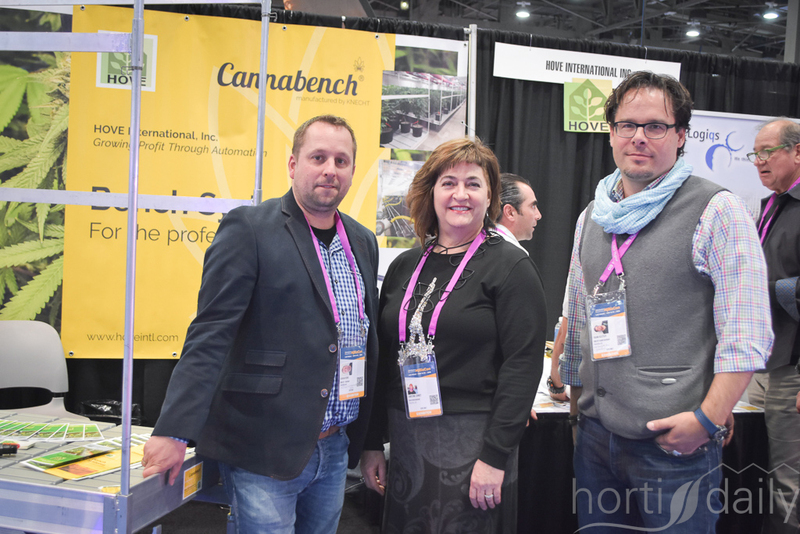 Frank Klatsch, Adrian Heine & Christine Lohrey with Knecht. 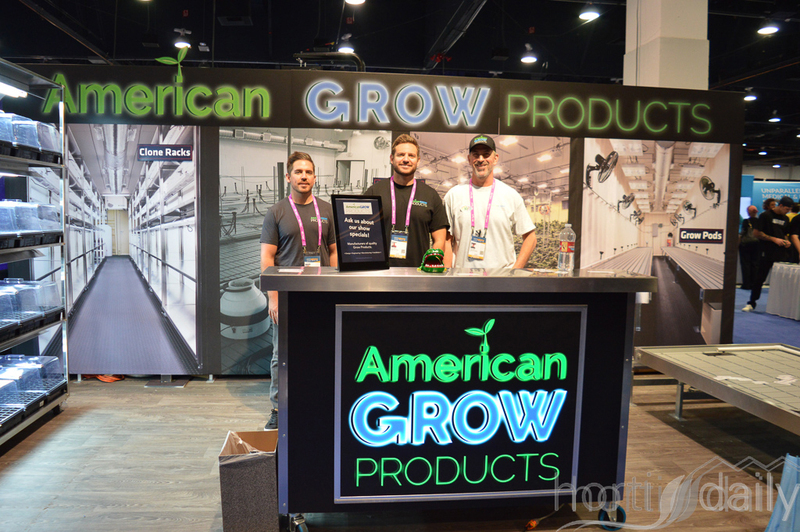 The company is celebrating their longevity in the industry. 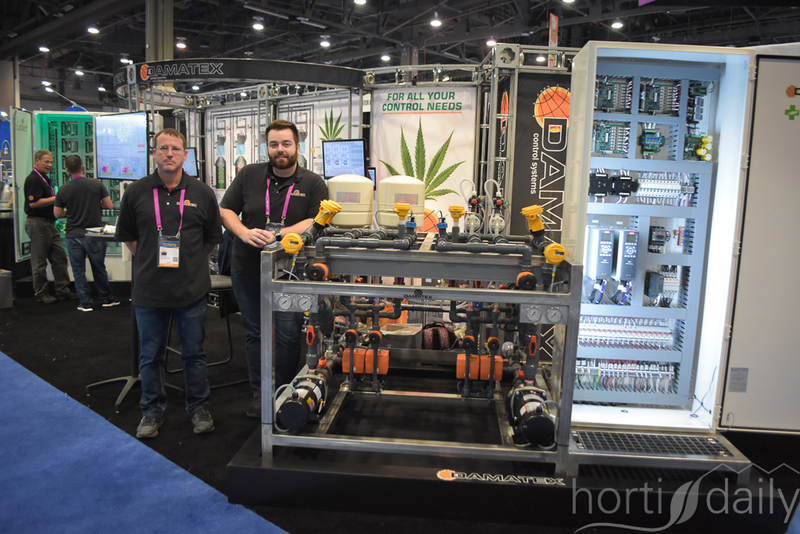 Automation is an important topic in the cannabis industry, both during the crop as well as post-harvest. 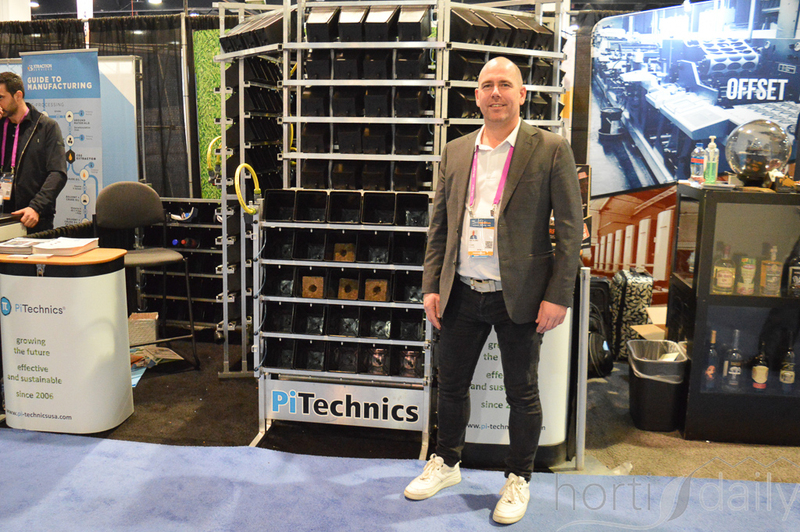 One of the solutions are the Futurola packing systems. 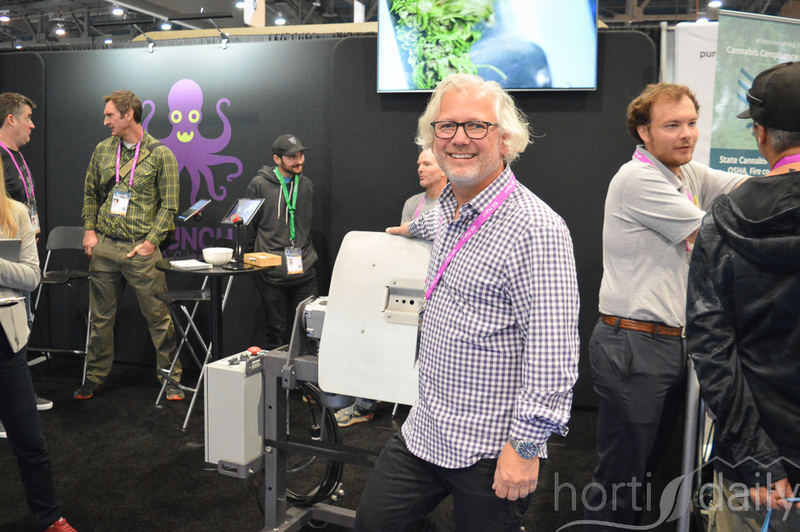 In the photo Patrick Eriksson with Futurola, visited by Carl Saling with Purity Cannabis. 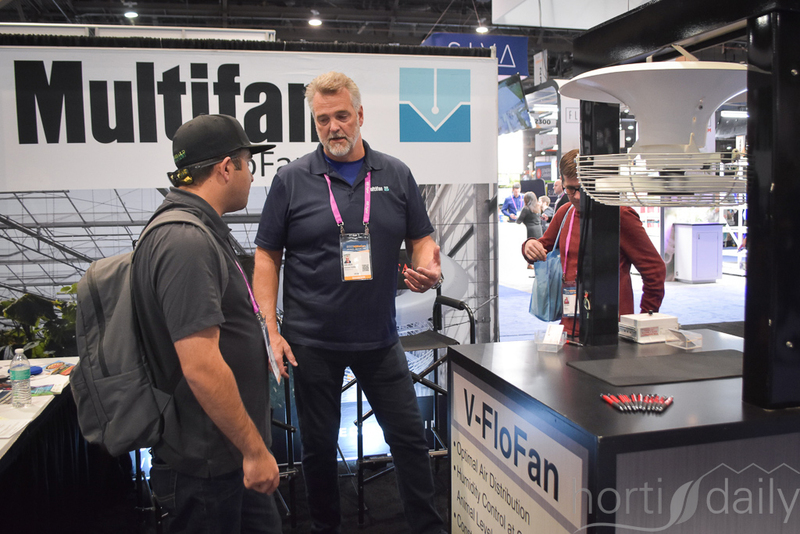 John Juhler with Vostermans Ventilation explaining about the Multifan system. 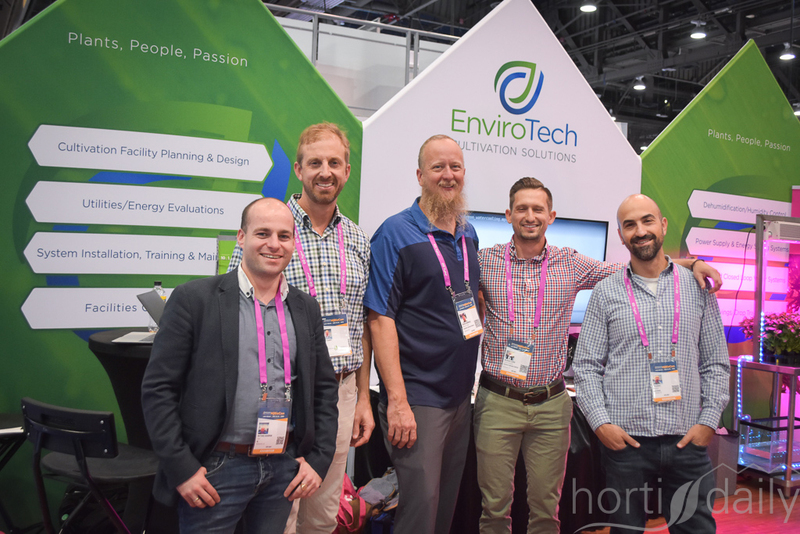 Matthias Haakman with Kees Greeve (left) visits the EnviroTech team: Kurt Parrst, Joshua Burbridge, Nicholas Clover & Zev Ilovitz. 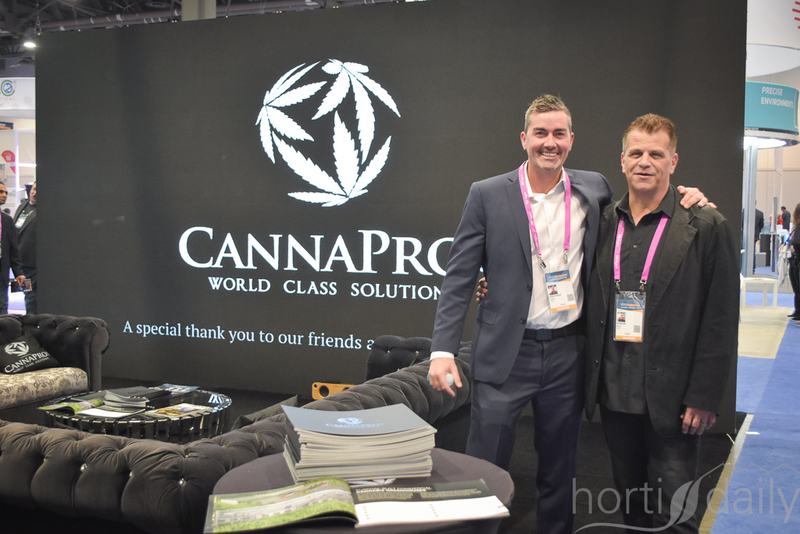 CannaPro supports MMJ growers in the designing and building of their facility, following the strict requirements to get the pharmaceutical grade. 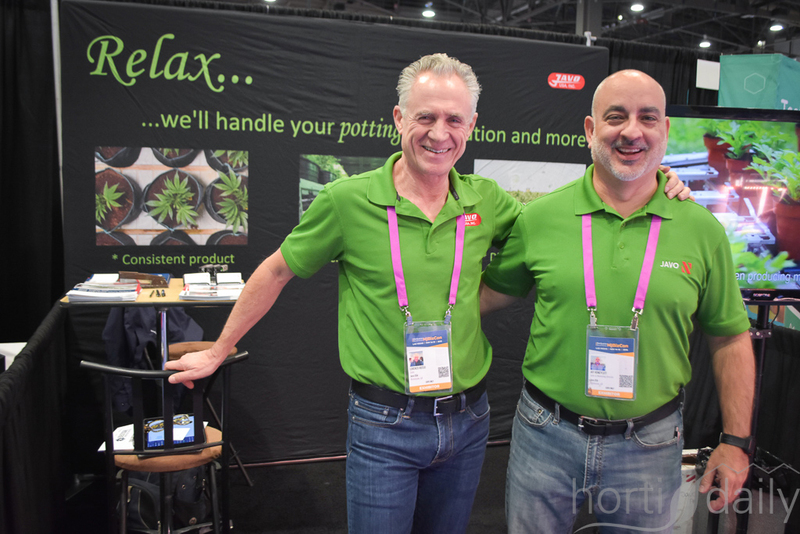 In the photo George Dickinson & Jon Himelfarb. 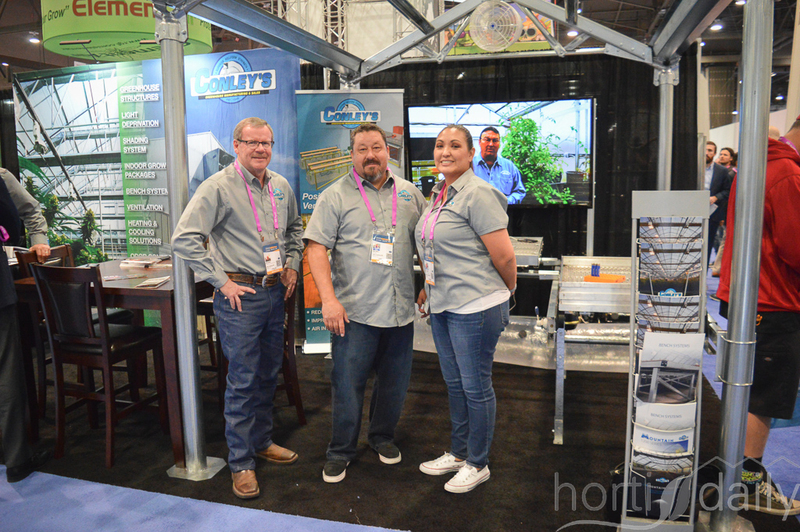 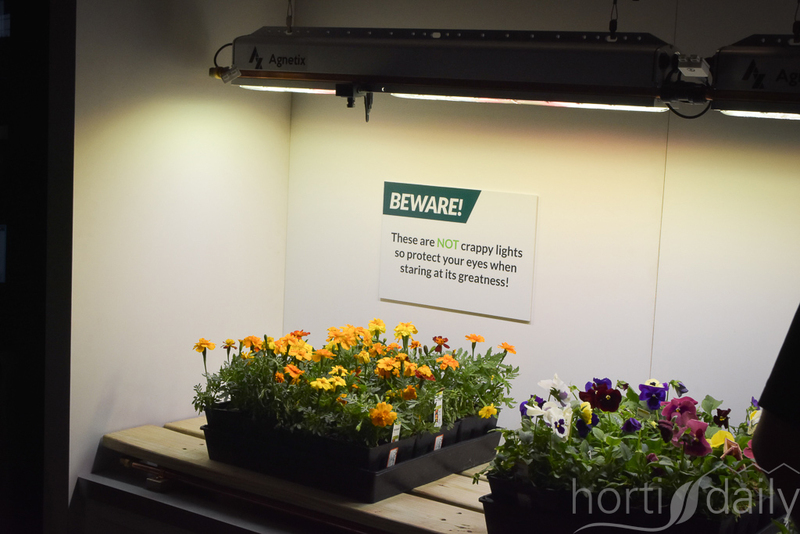 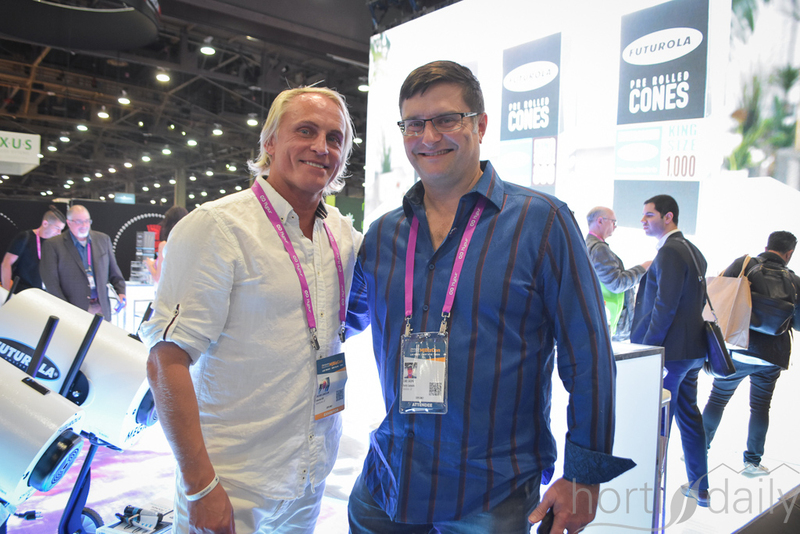 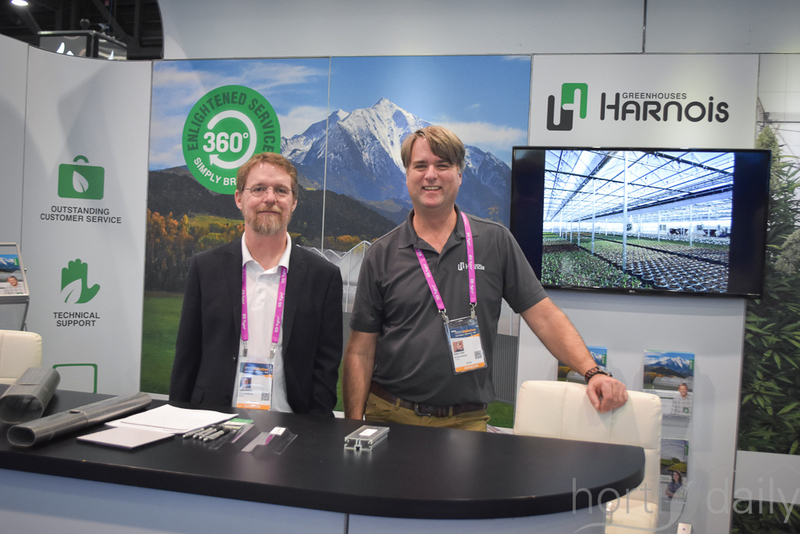 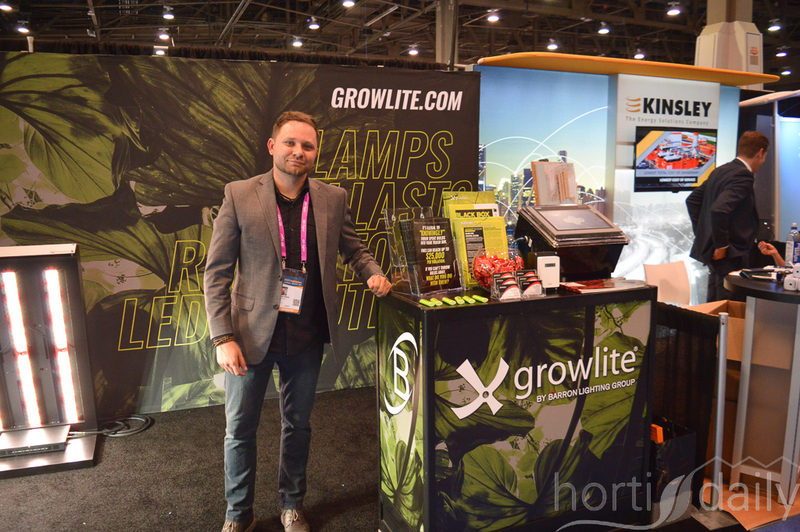 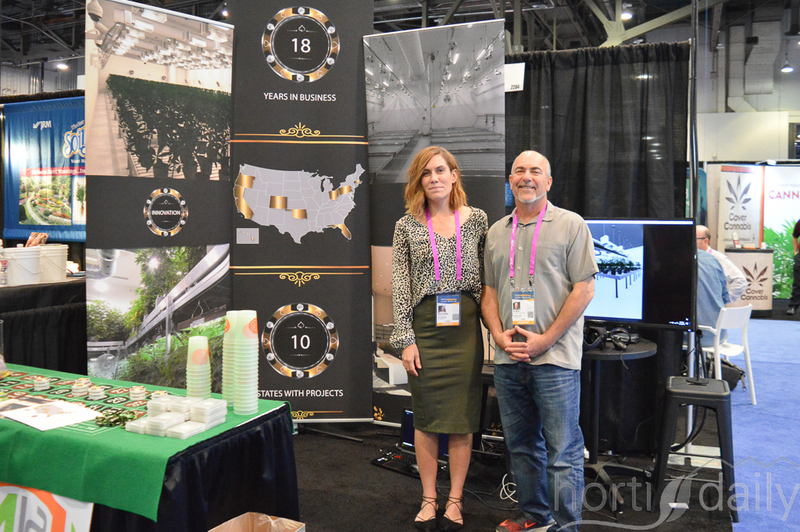 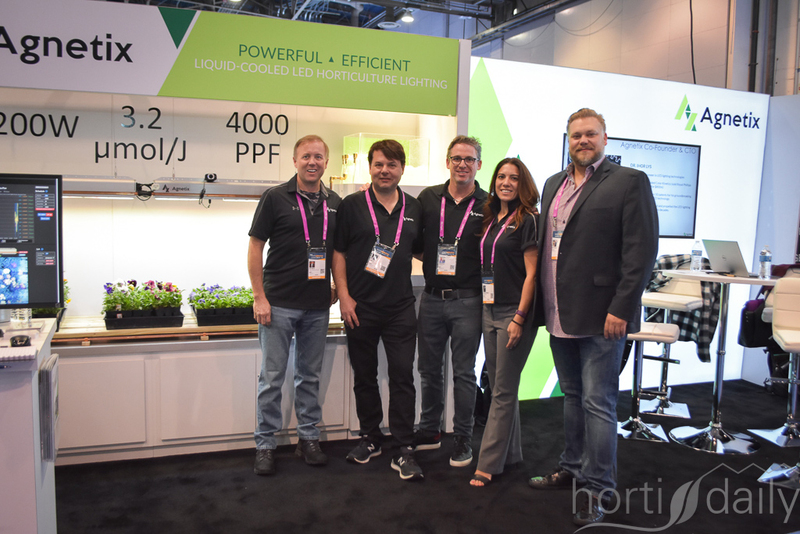 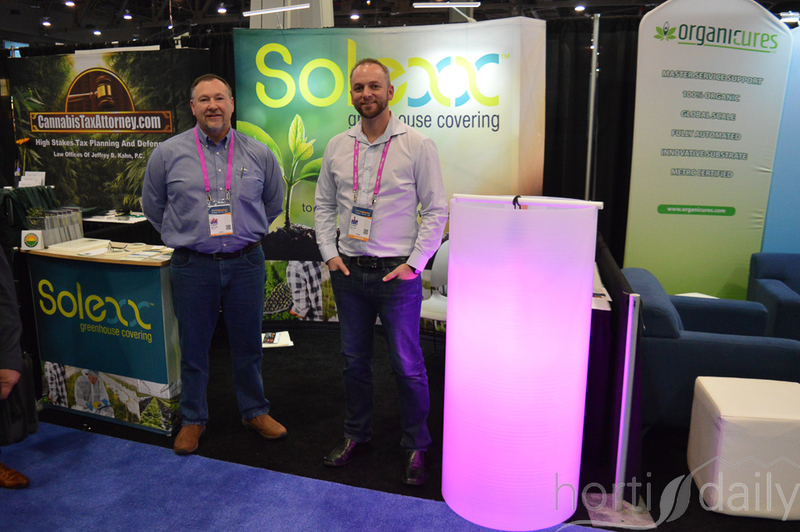 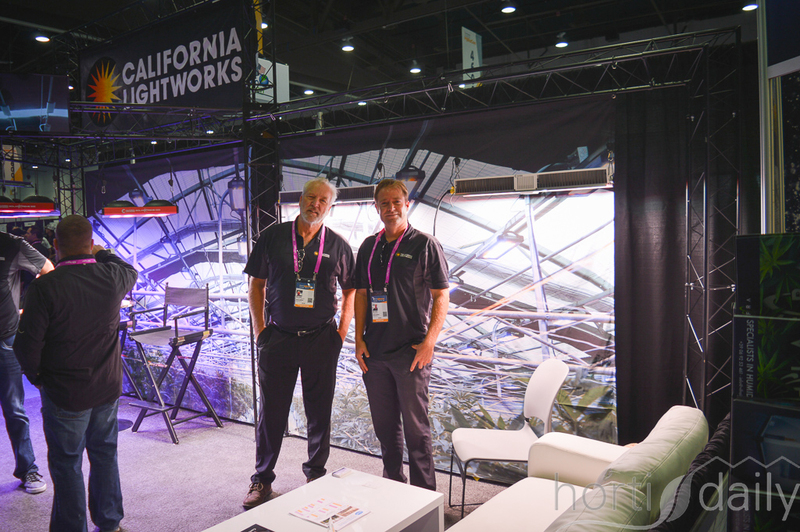 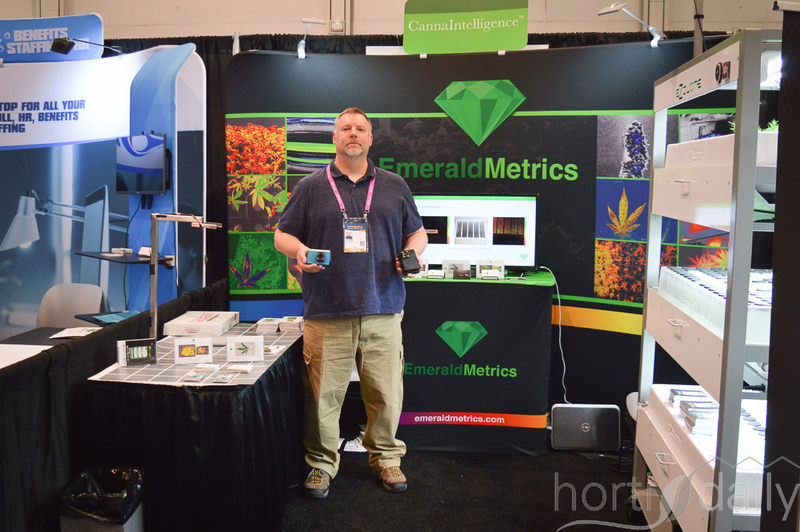 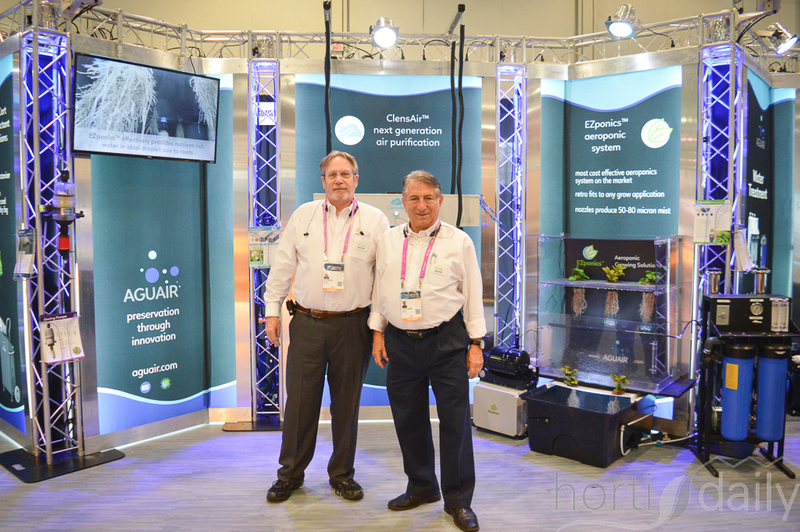 California LightWorks, a U.S. manufacturer of LED horticultural lighting, was present at the show. 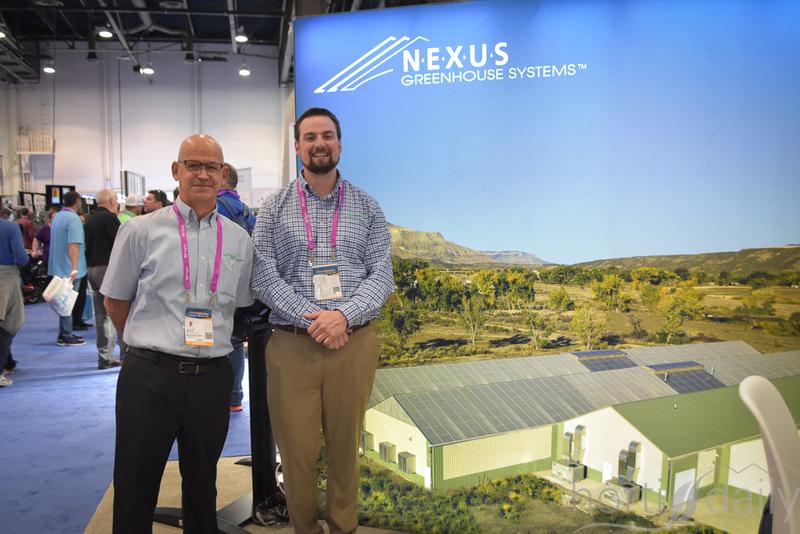 Nico Niepce with Alweco & Craig Riesebosch with Westland Greenhouse Solutions. 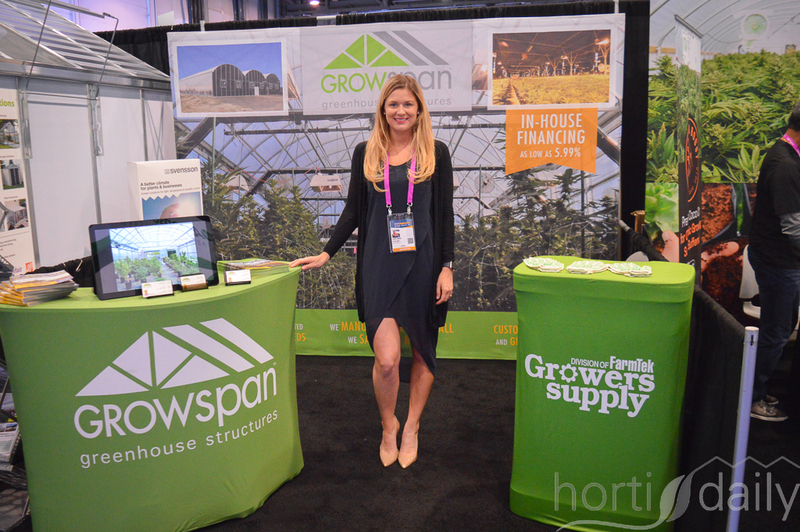 Lauren Blindahl is active in the Californian market with GrowSpan. 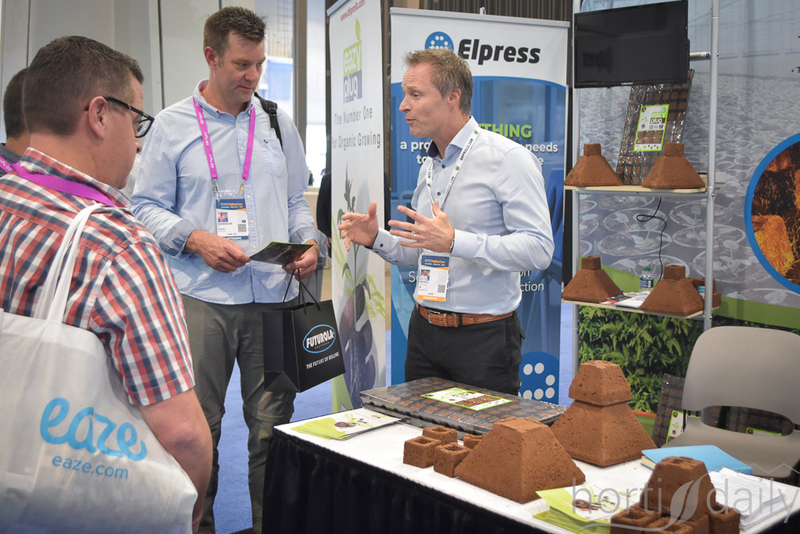 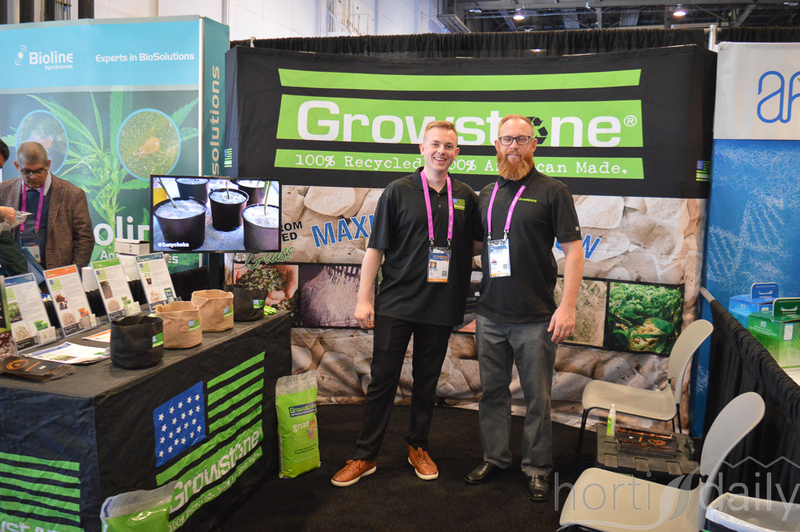 Barry Toornman and Ian Mclennan featuring Growstone's various gradient of stones for use in plant growth. 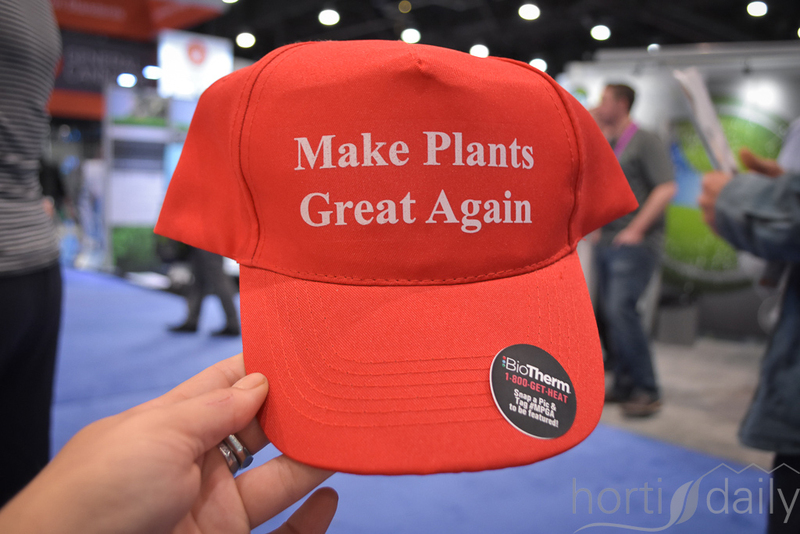 You can add you're own cap-tion to this photo. 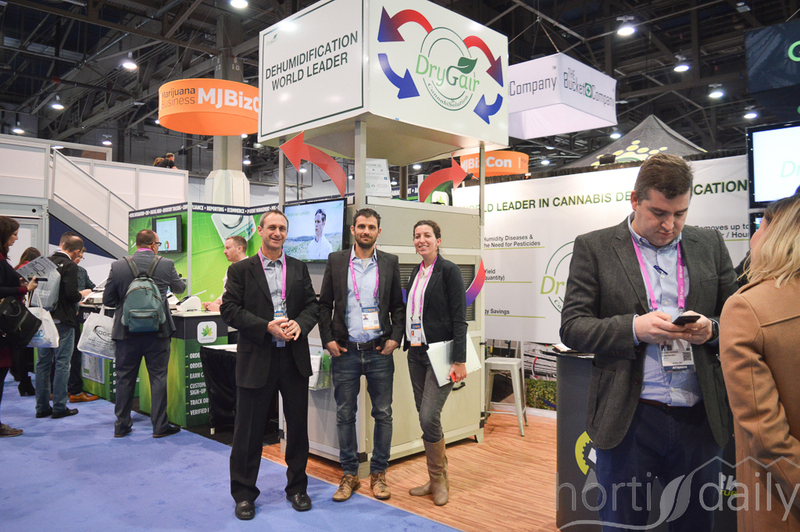 With over a 1000 companies looking for the visitors attention, there were of several promotion teams on the exhibition floor. 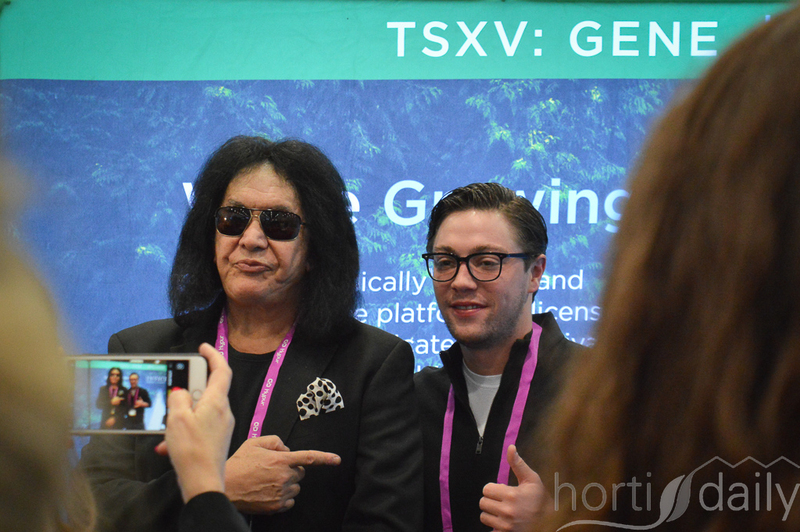 Gene Simmons promoting a partnership organization, Invictus MD Systems. 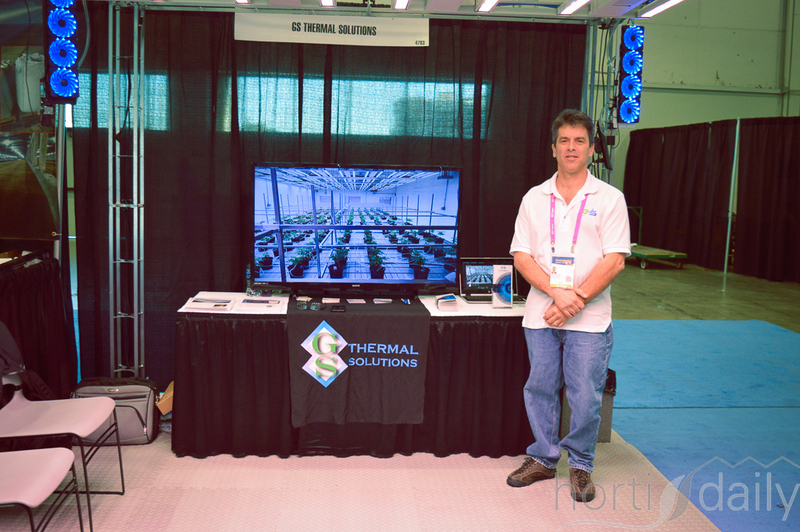 And of course the Fluence team present as well! 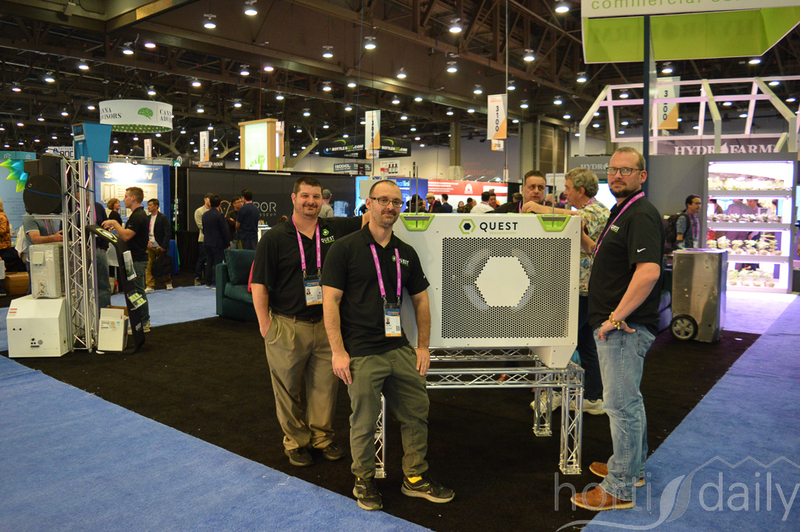 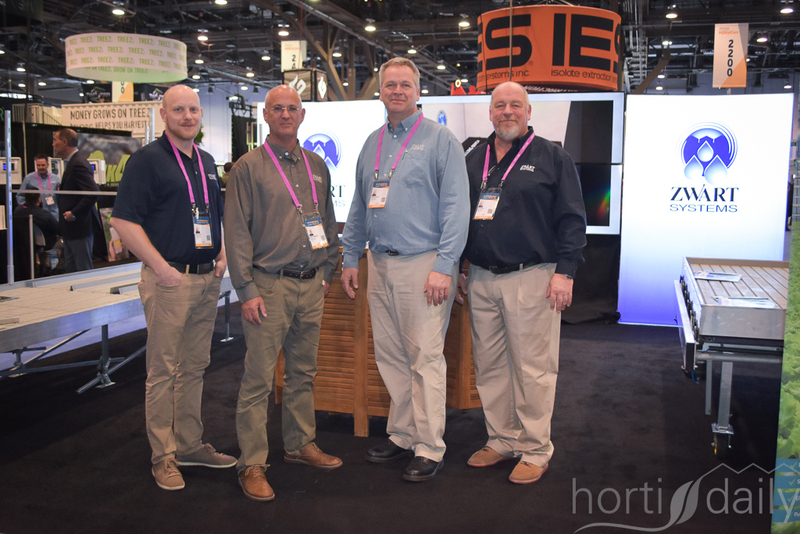 Barry Alders, Robert Vandersteen, Andrew van Geest & Isaac van Geest with Zwart Systems. 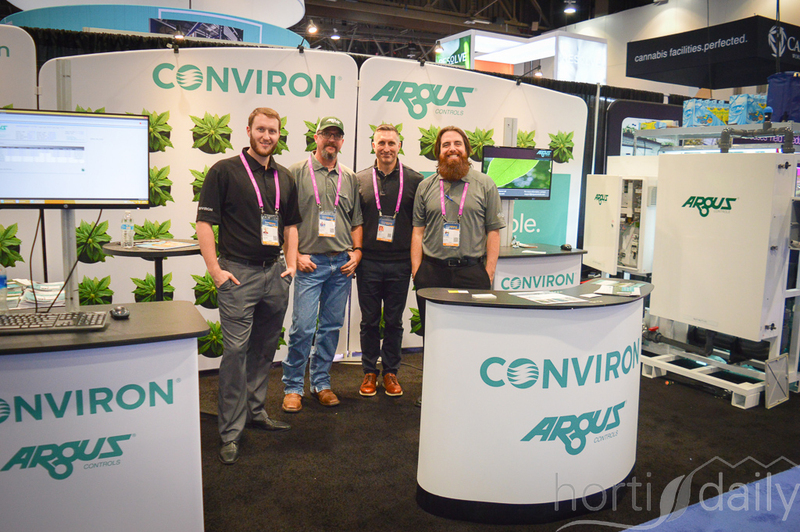 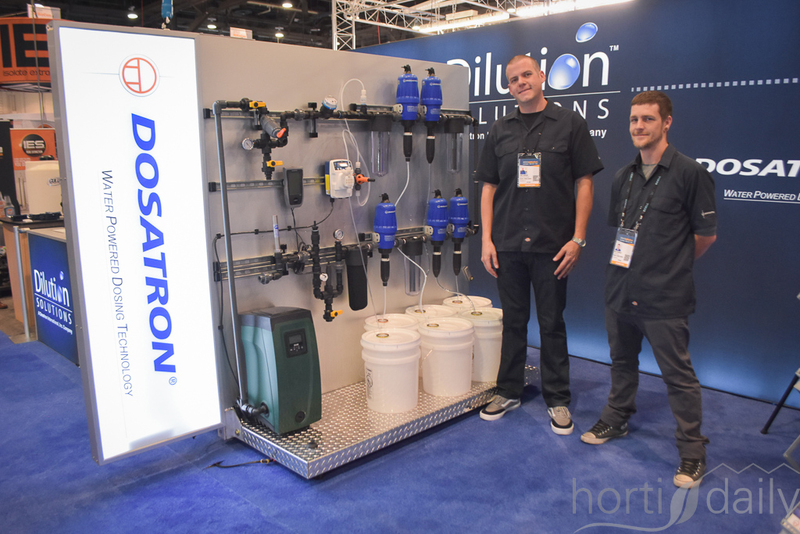 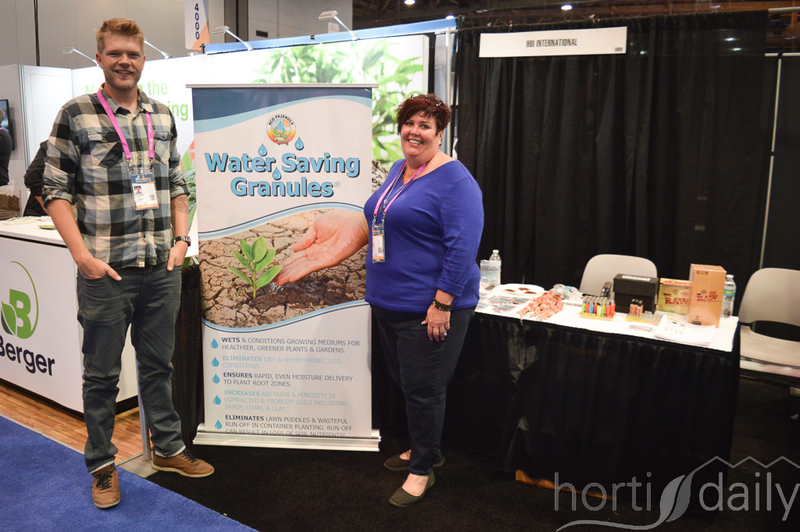 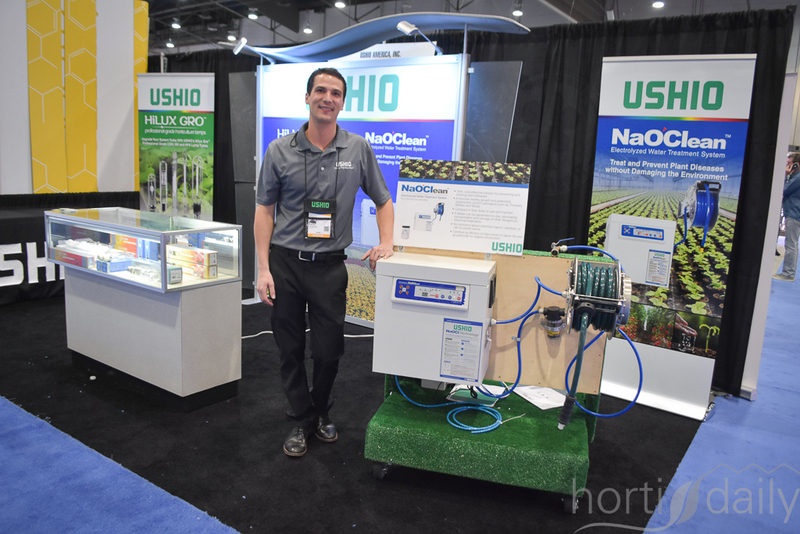 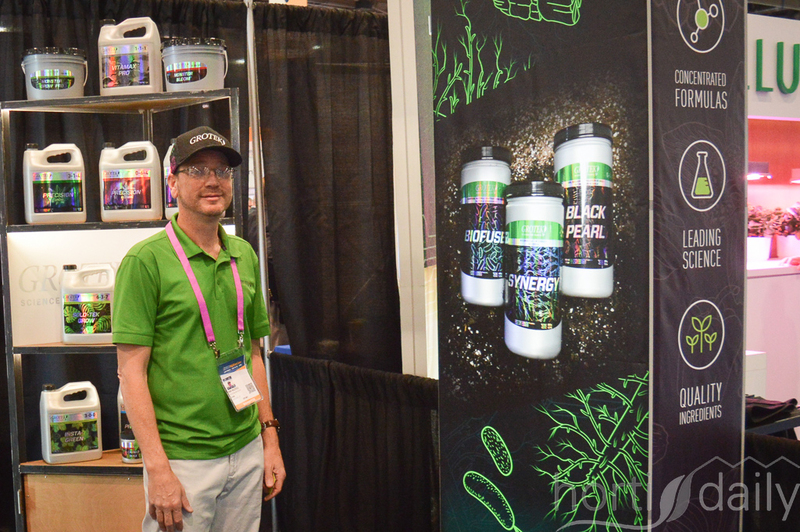 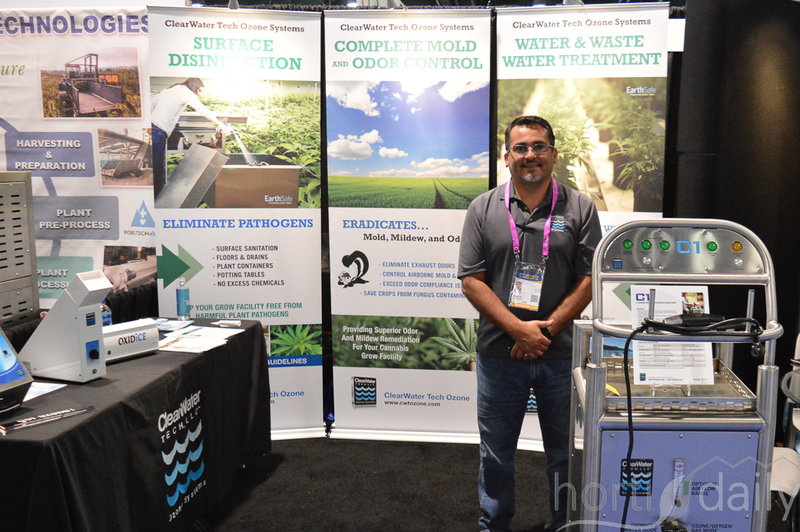 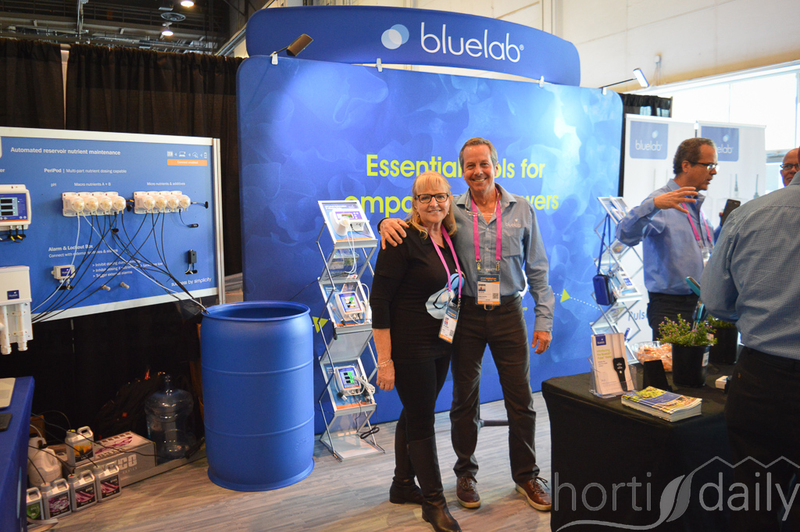 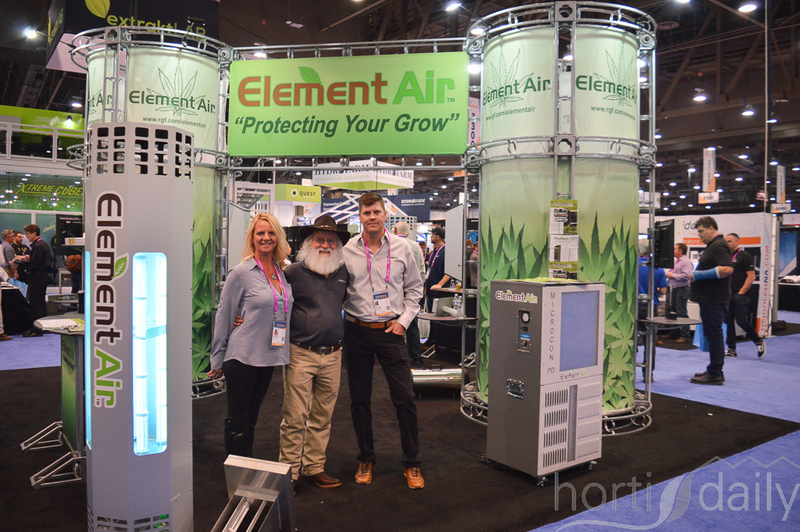 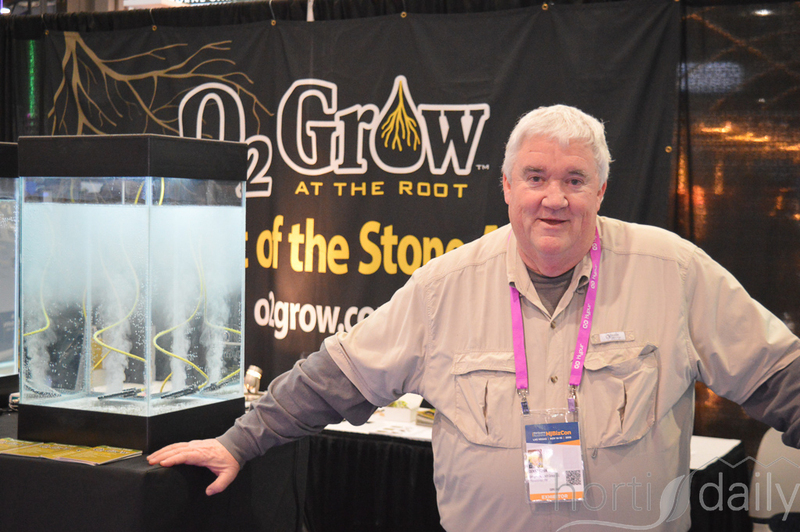 The team with Dilution Solutions is now offering modular, plug-and-play solutions to growers. 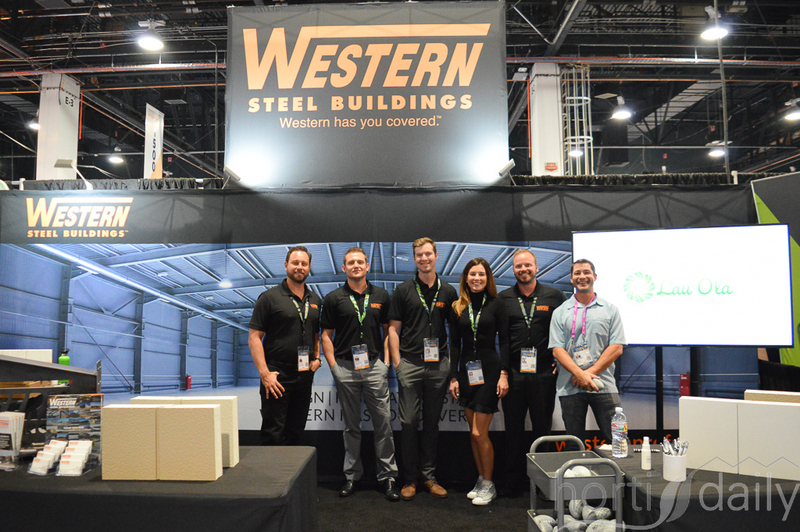 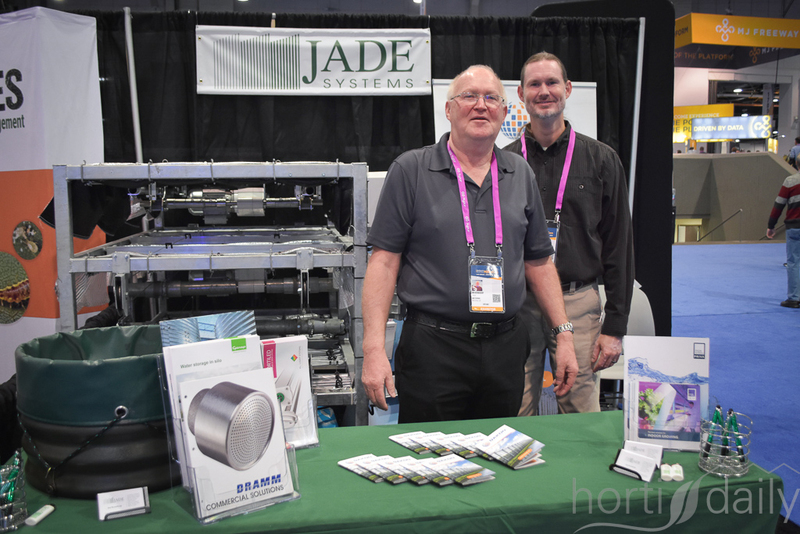 Jan Koenekoop & Scott Fender with Jade Systems brought the modular screening installation, updated with a new product. 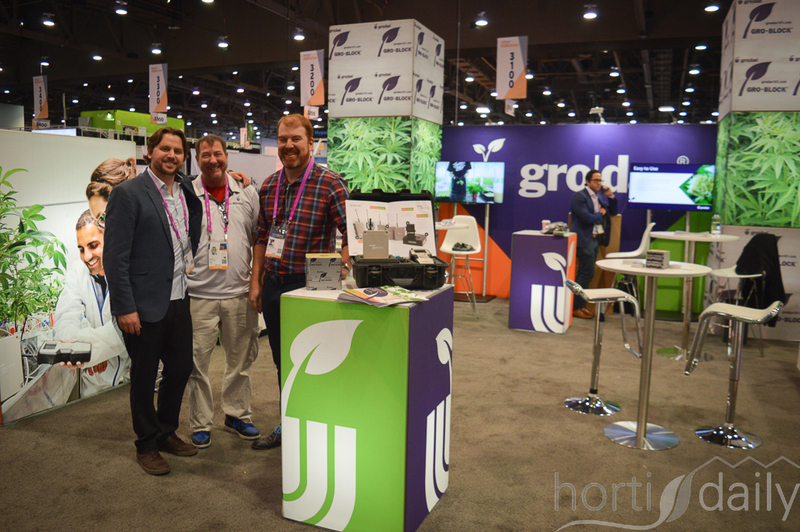 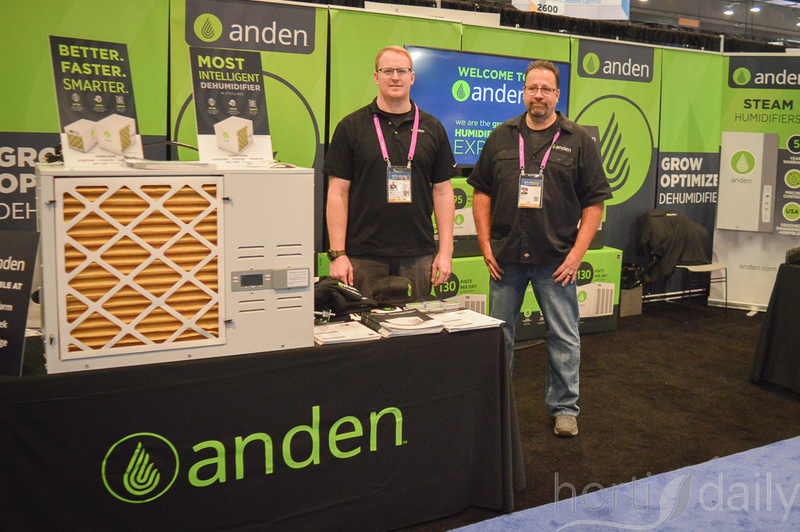 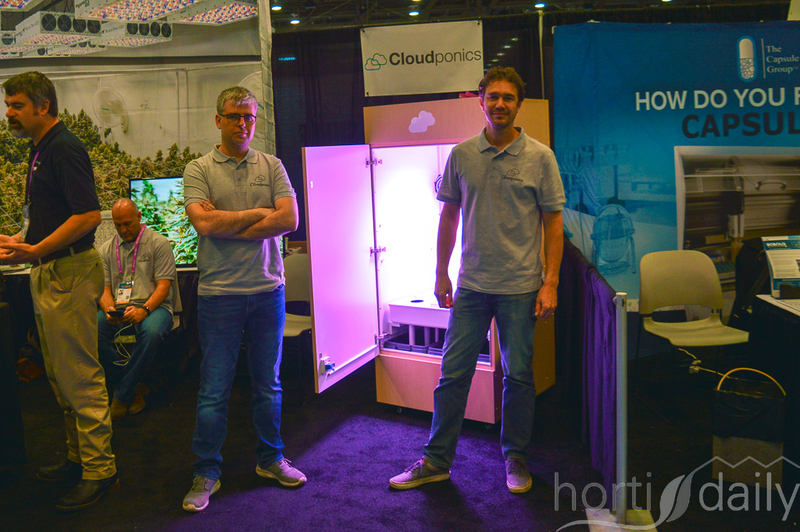 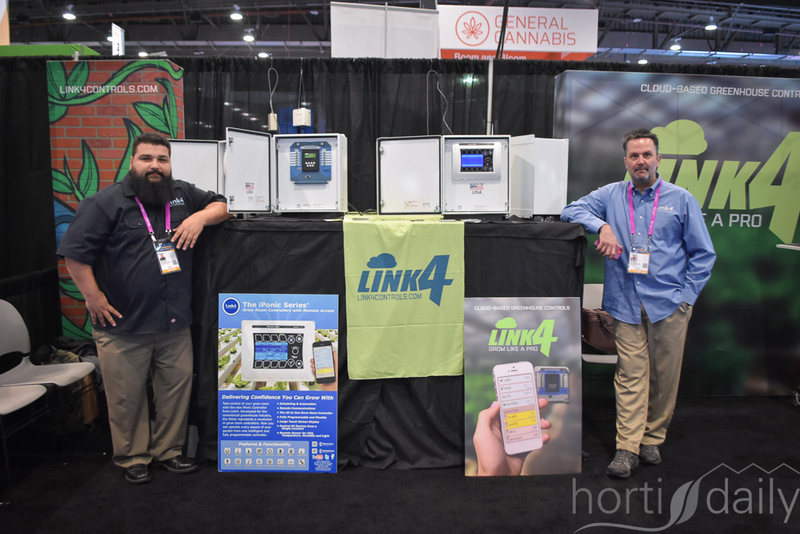 John McGuire & Jeff Gibson with Link4 Greenhouse Controls, developer of a all-in-one grow room controller. 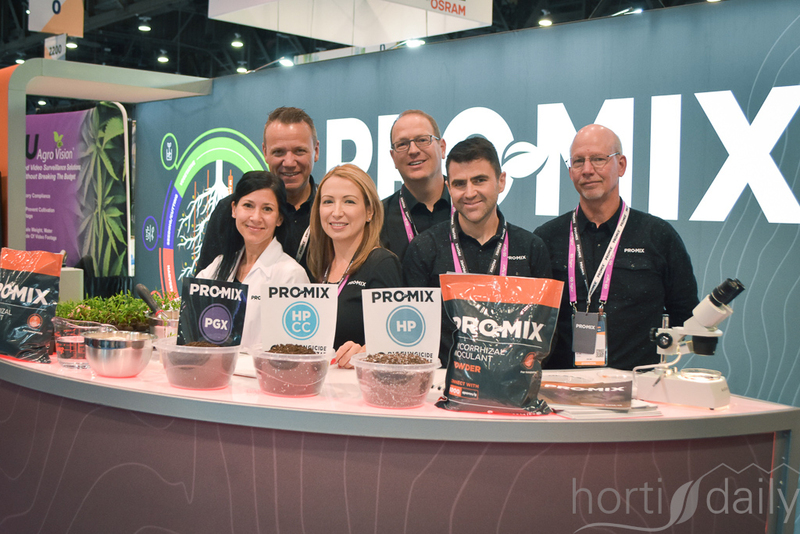 Pro-Mix is bringing a new mycorrhizal inoculant powder to market in 2019. 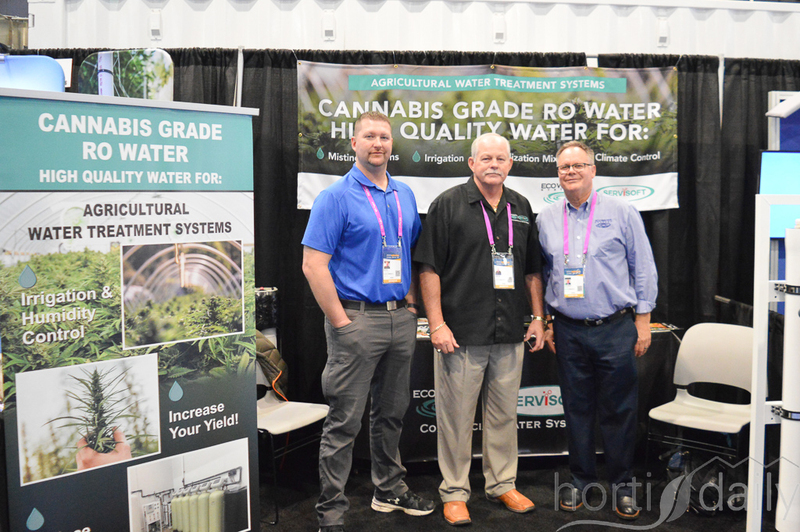 Thanks to the special aseptic conditions under which it is being created, it is to upgrade the viability of the plant thanks to a bettered, stronger root system. 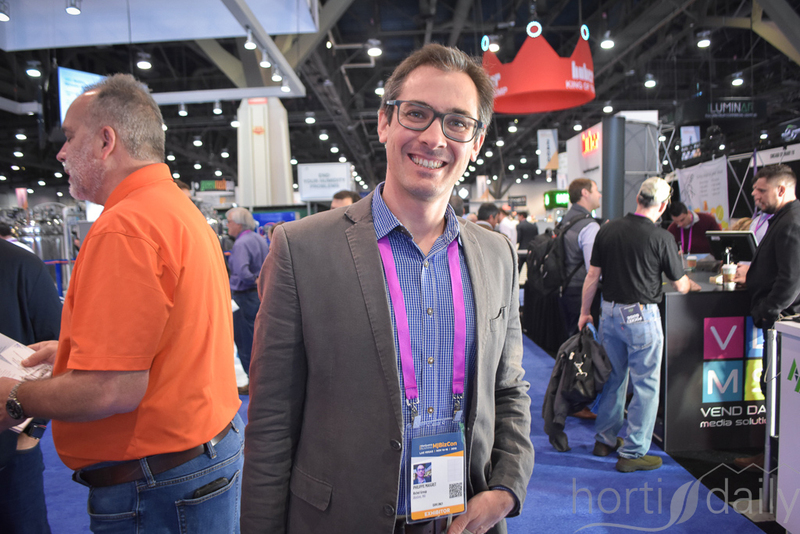 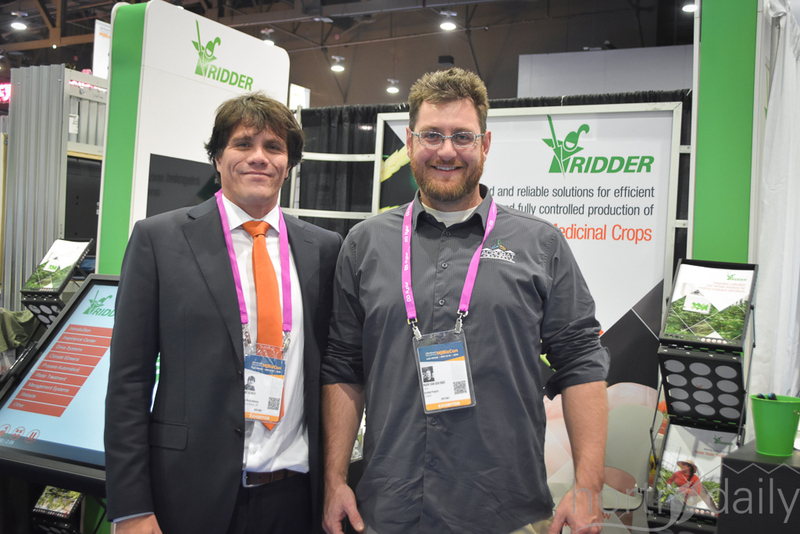 Philippe Maigret with Richel Group paid a visit to the show. 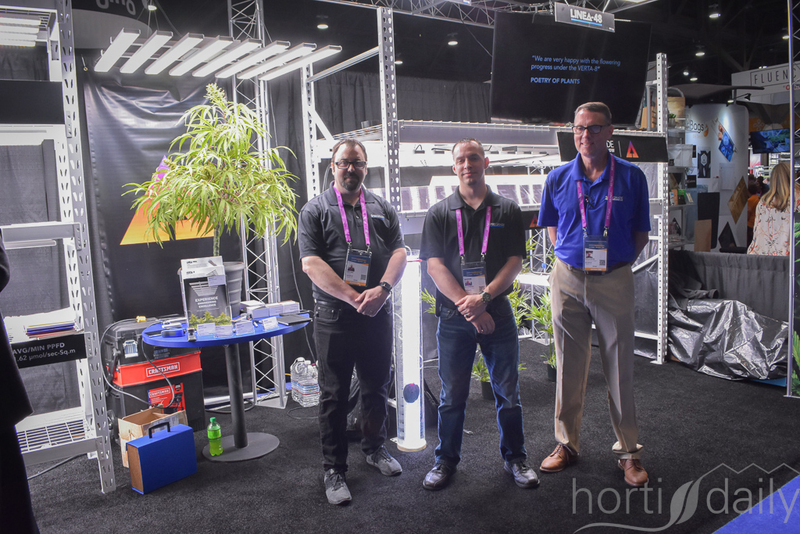 With many high-quality LED-suppliers being at the show, many sunglasses were needed and provided as well. 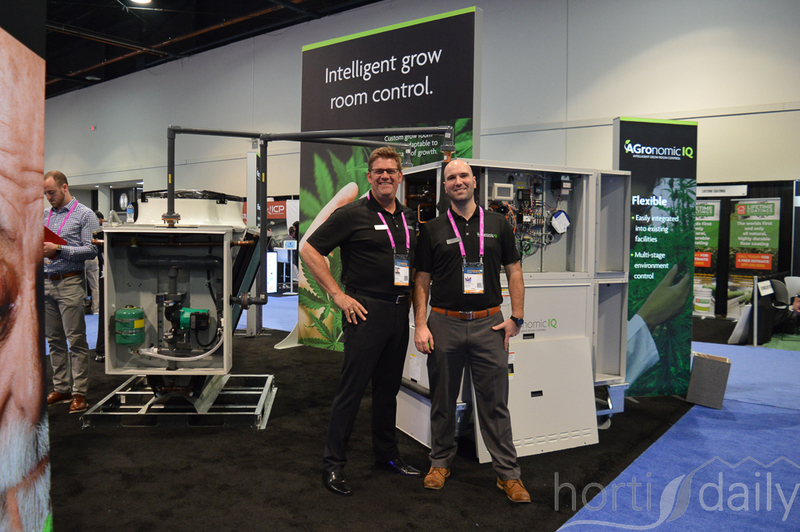 The Agnetix HERO goes up to 4000PPF and is said to be highly efficient. 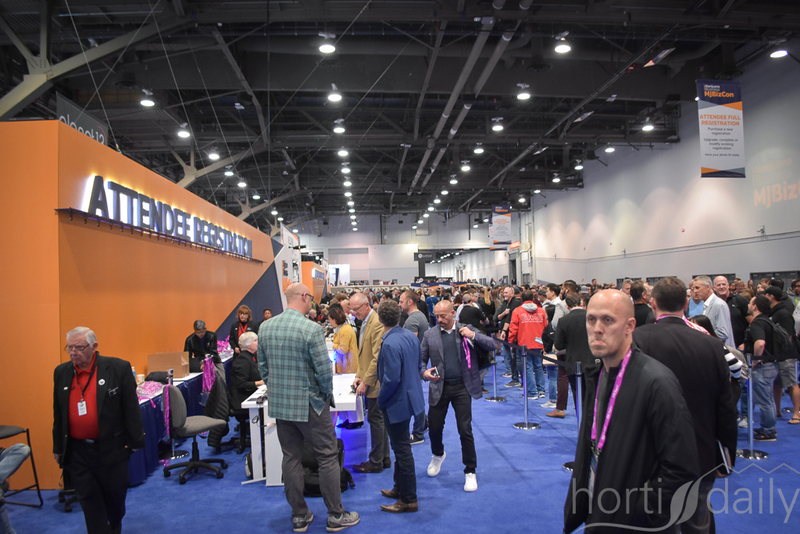 Big lines at the registration desks. 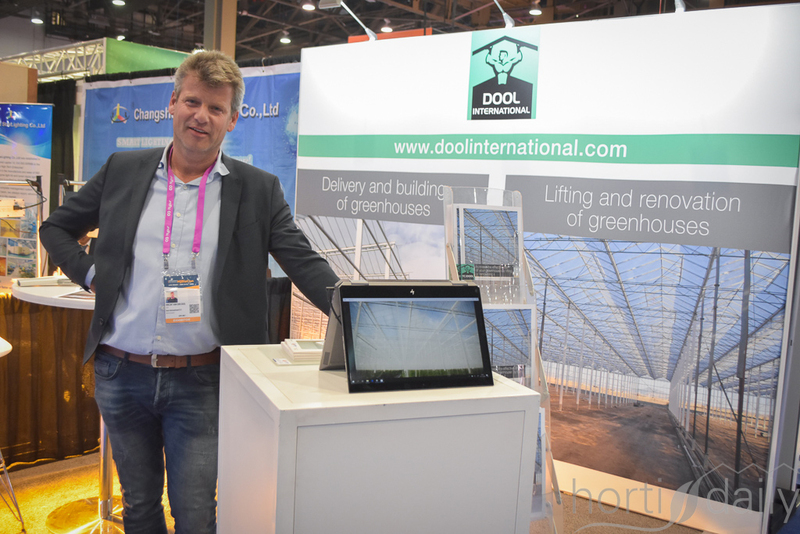 Frank Boers & Sander van der Ven with BOAL Systems, provider of aluminium greenhouse roof and side-wall systems. 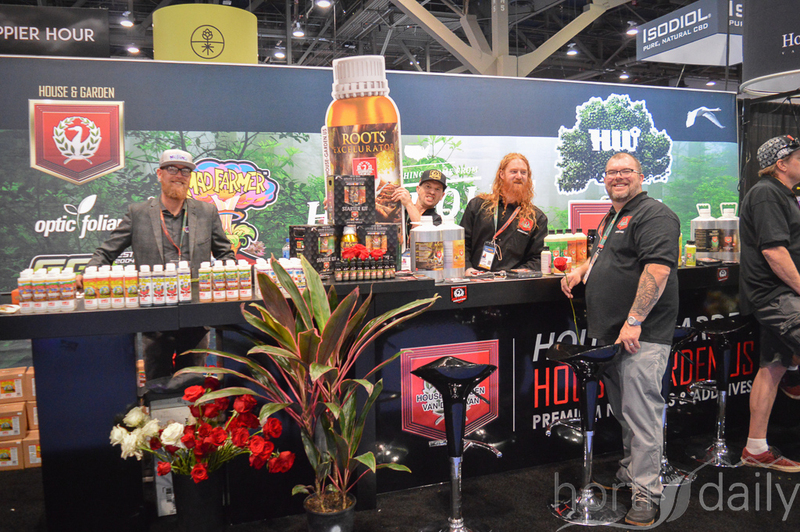 A large variety of exhibitors - for example Two Roots Brewing Company, offering fusion products of cannabis and beer. 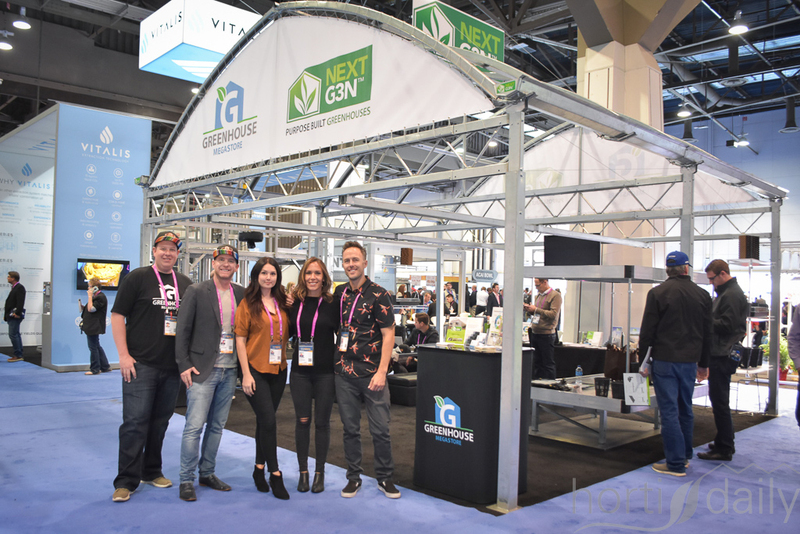 Zach Schell & Ben George with Greenhouse Megastore and Ashley Bachelder, Lisa Mckernan & Mike Still with NextGen. 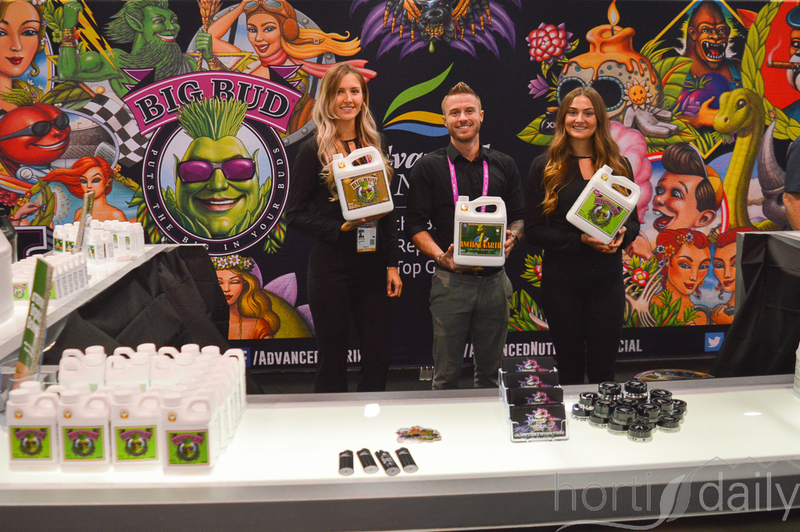 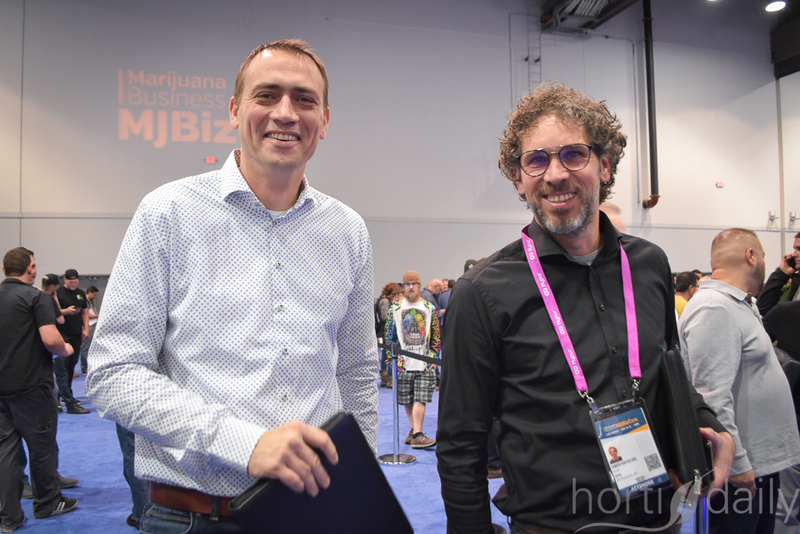 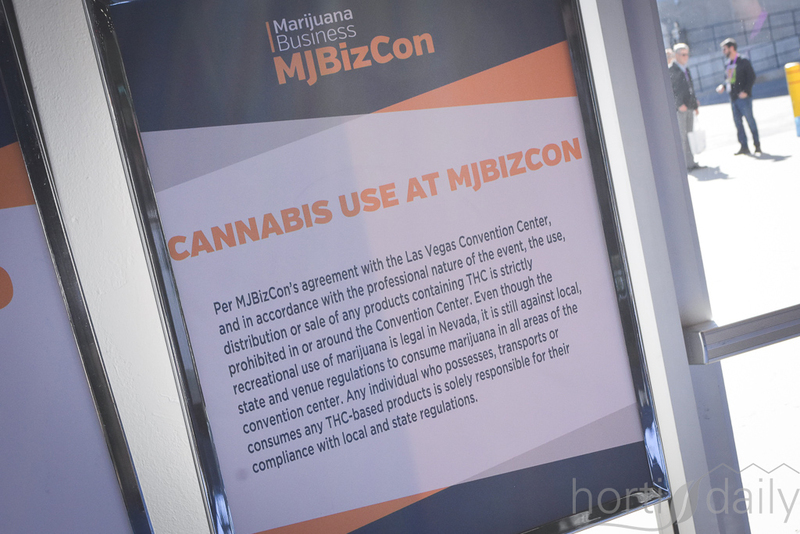 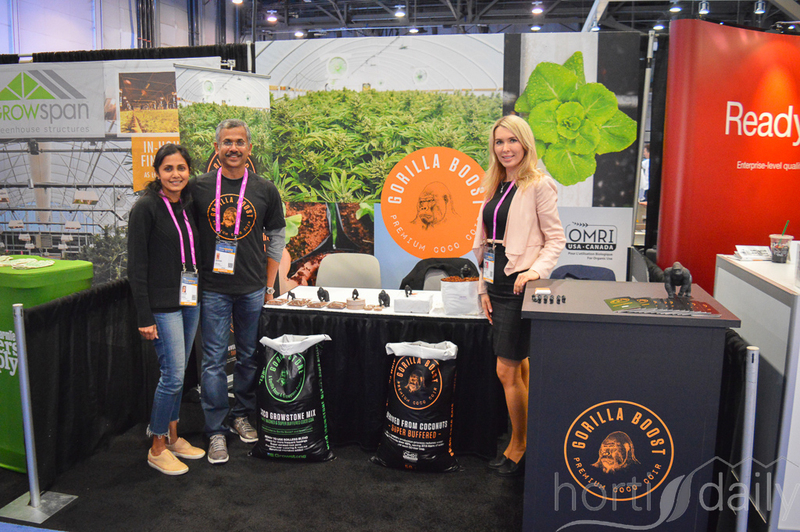 Although smelling might have told you differently every now and then, cannabis use was prohibited at the MJBizCon. 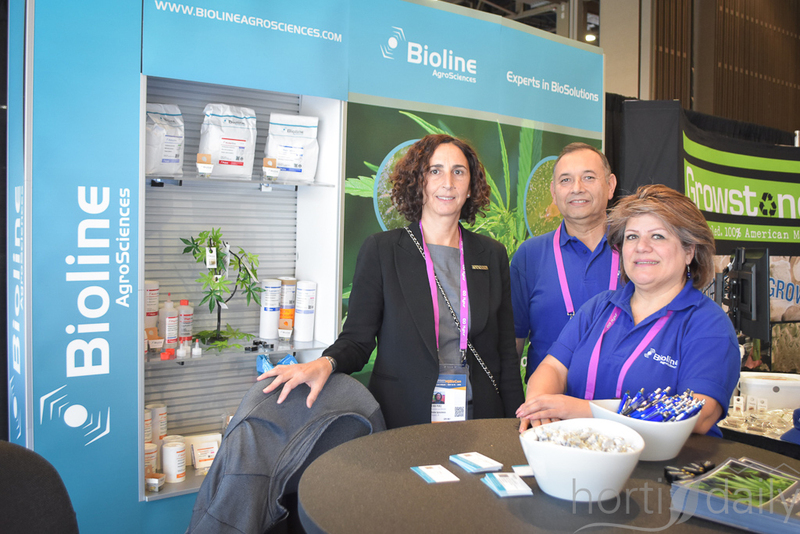 Cora Perez, Ascensión Urquidez & Tina Ziaei with Bioline AgroSciences. 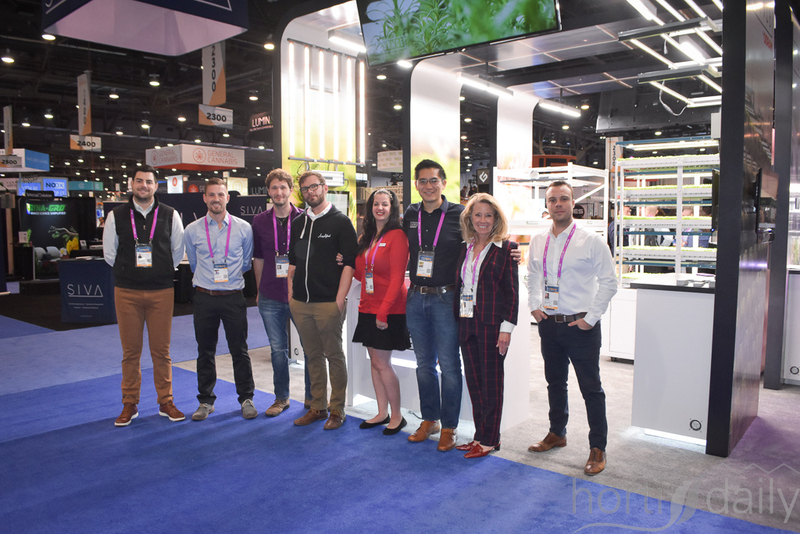 Biological crop control is not as big a topic in the cannabis industry as in the hydroponic vegetables at the moment, but since the rules are very strict its importance is expected to grow. 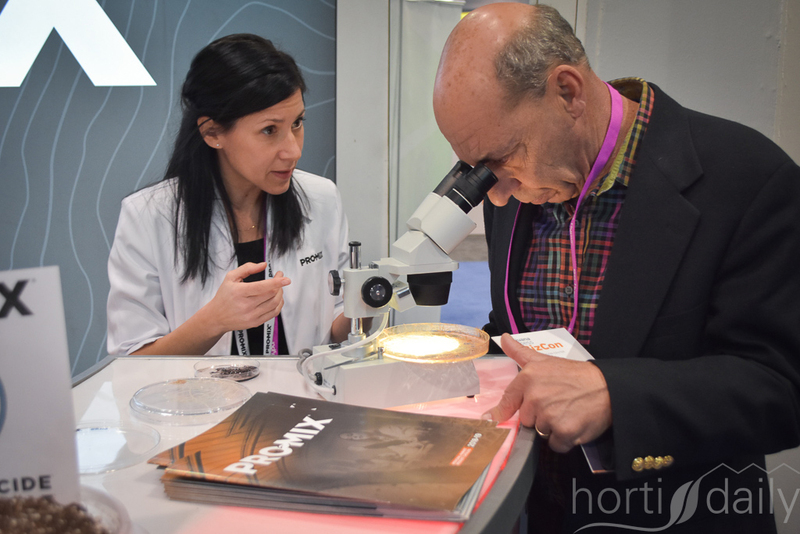 Do not forget your starting material. 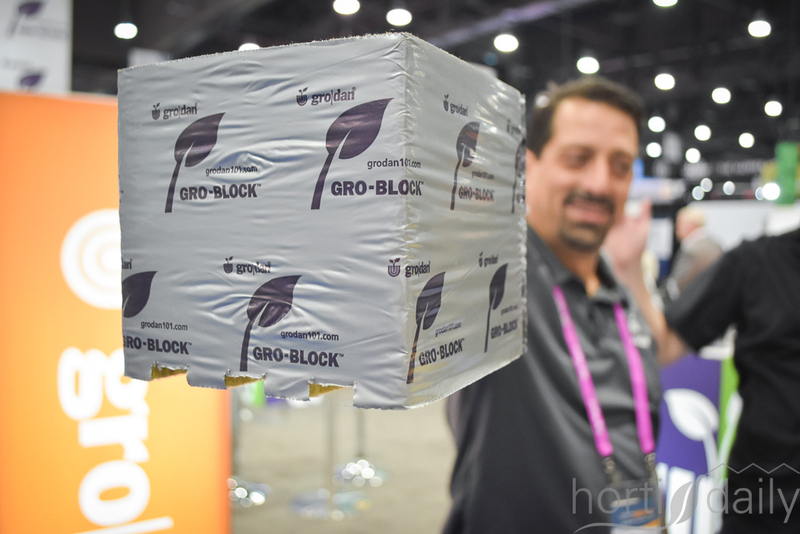 Grodan showed their Gro-Blocks. 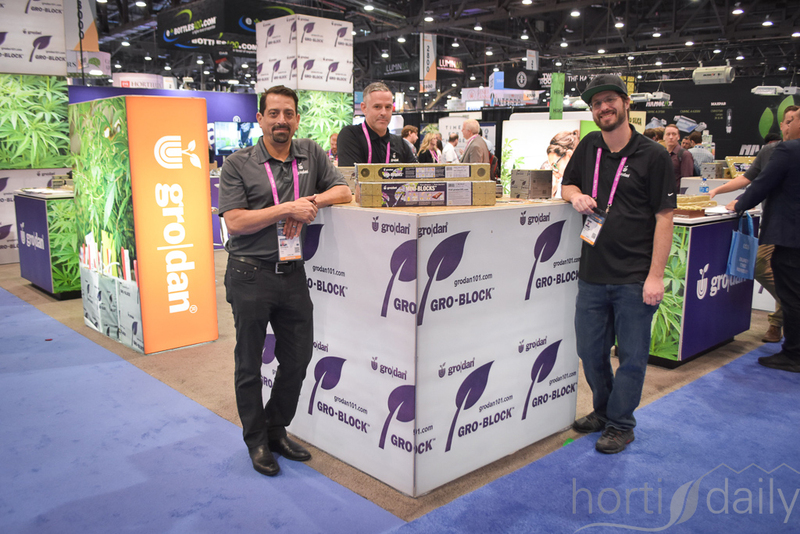 Akram Krayen, Dave Kennedy & Scott Saltzman with Grodan. 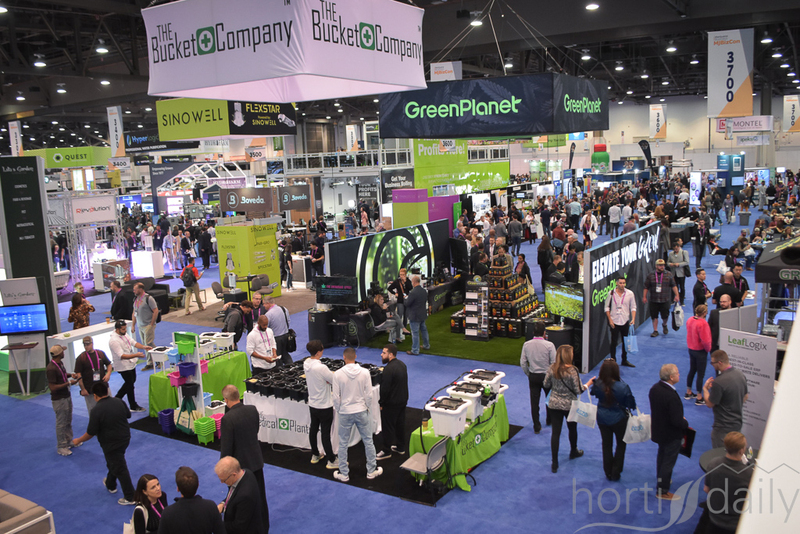 Crowded, crowded, crowded. 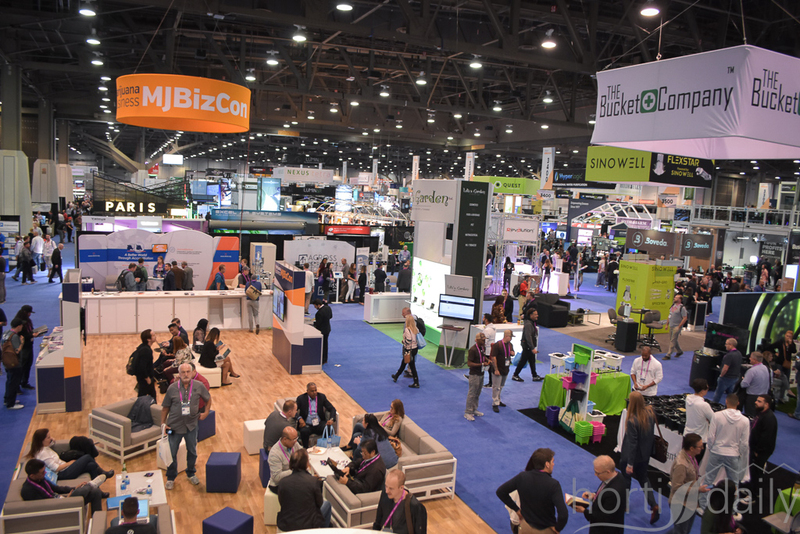 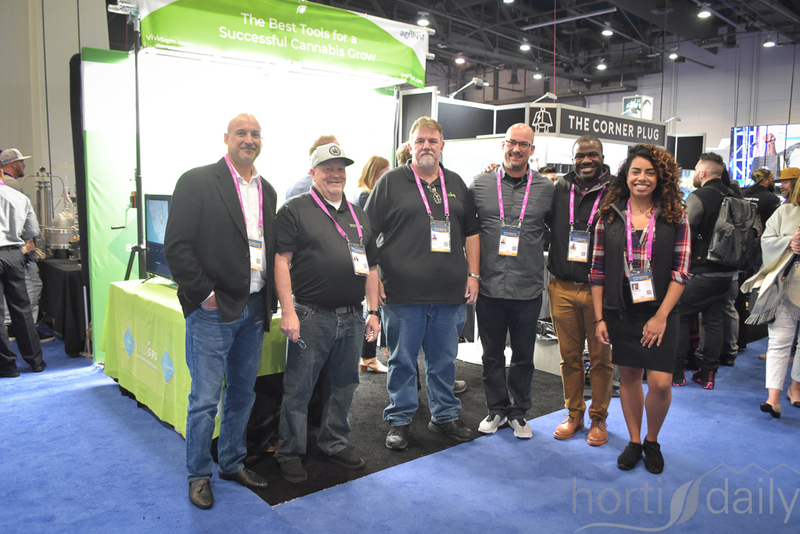 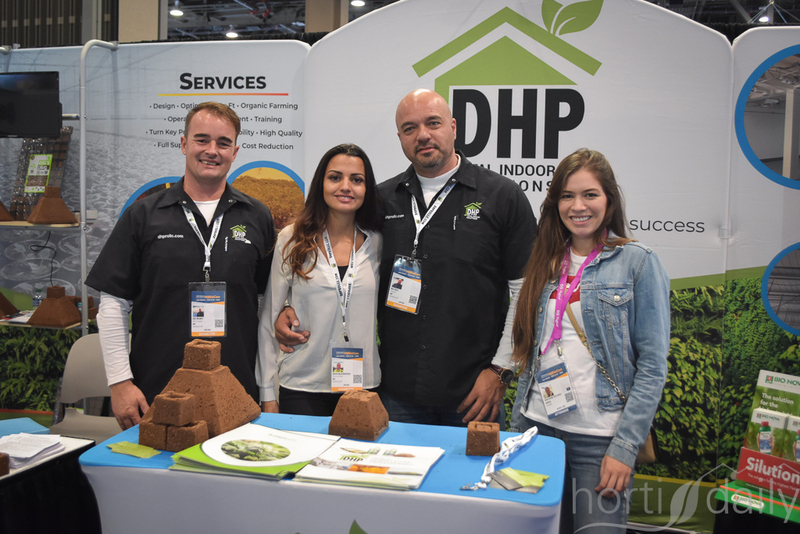 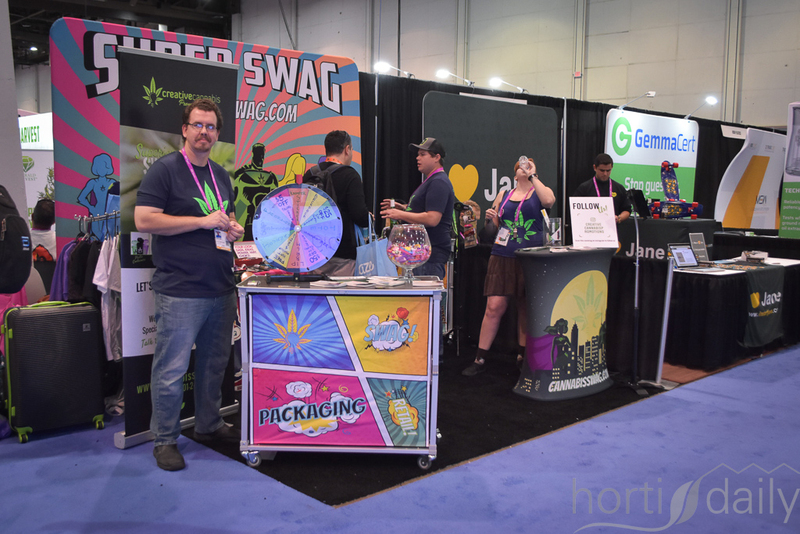 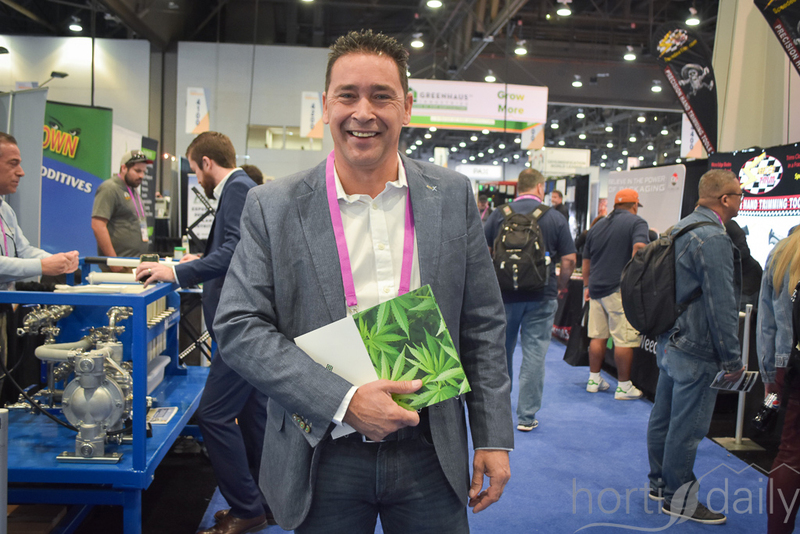 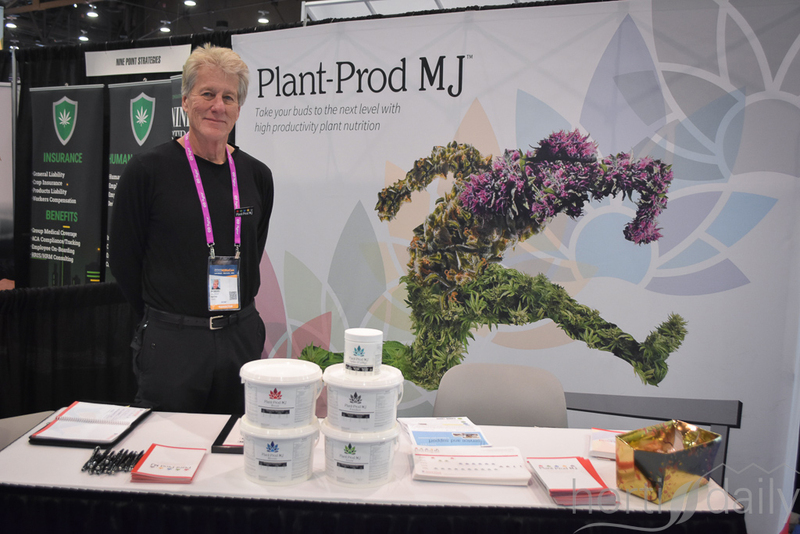 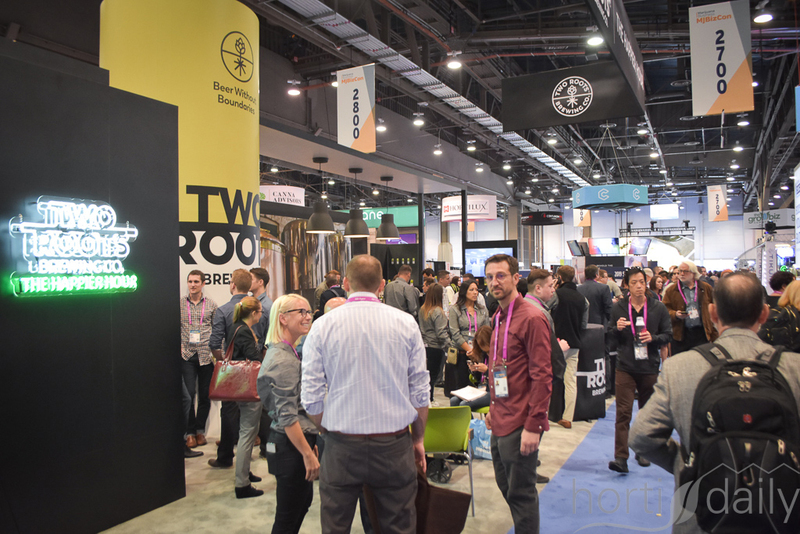 Over 25,000 marijuana industry professionals, investors and entrepreneurs were expected to attend the three-day conference at the Las Vegas Convention Center - 7.000 more than last years 18.000. 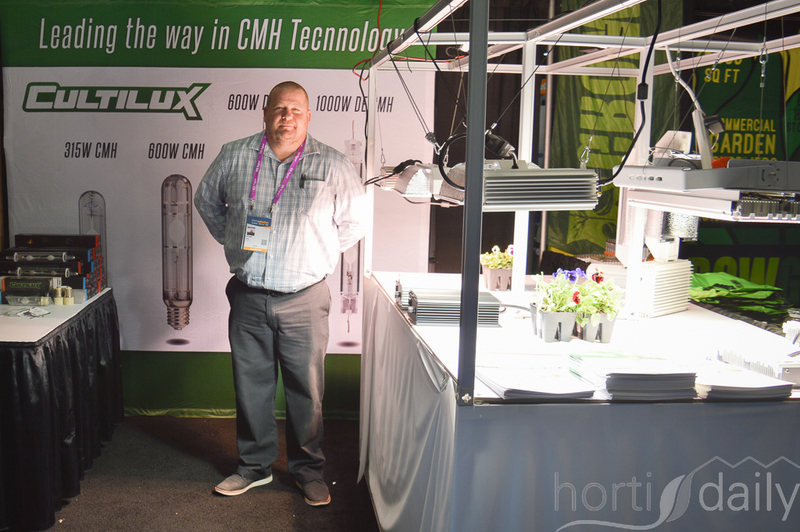 Dennis Dullemans with Agrolux present at the stand of Hawthorne Gardening Company. 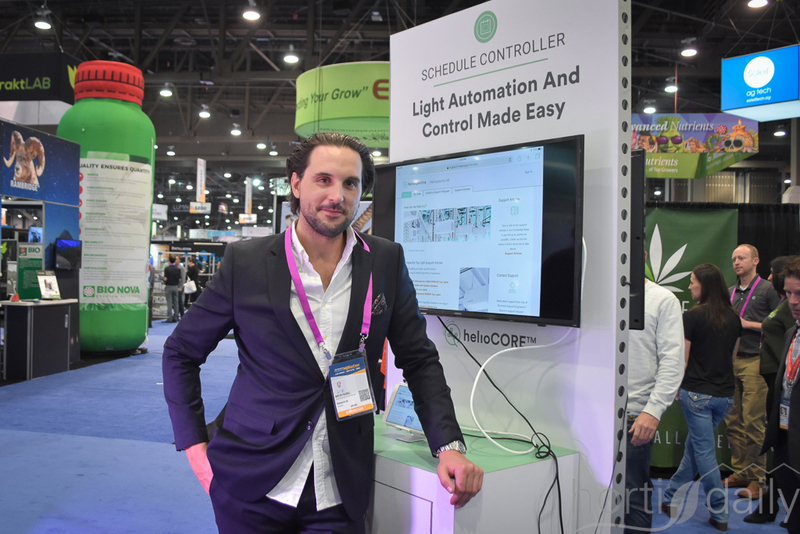 Wiktor Paukull with Heliospektra is showing their recently launched LED solution. 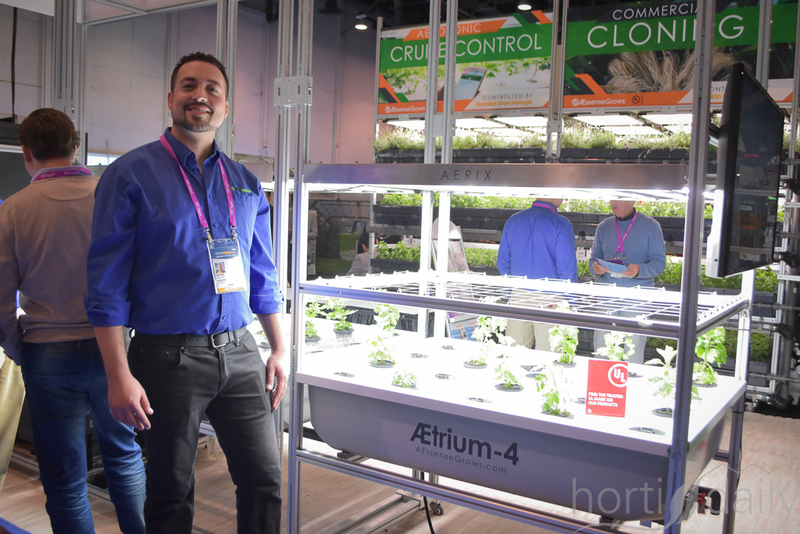 Offering 5 different spectrums, the fixture is offering opportunities in the grafting of tomato plants. 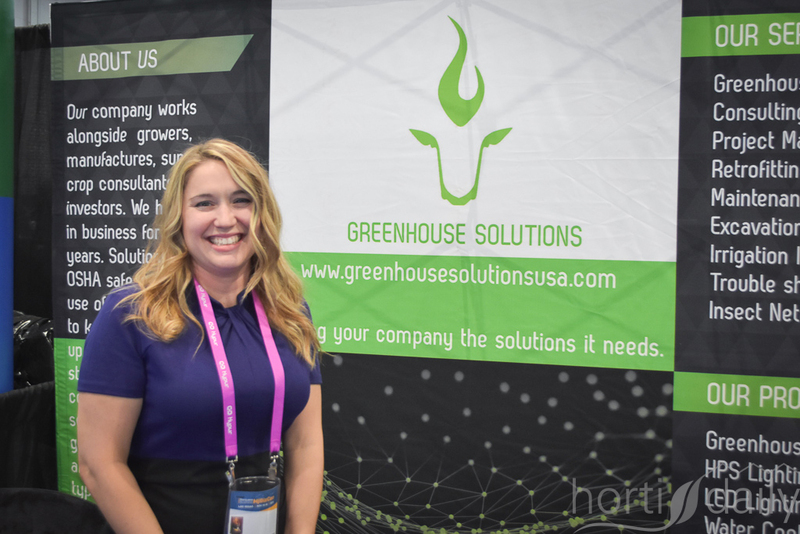 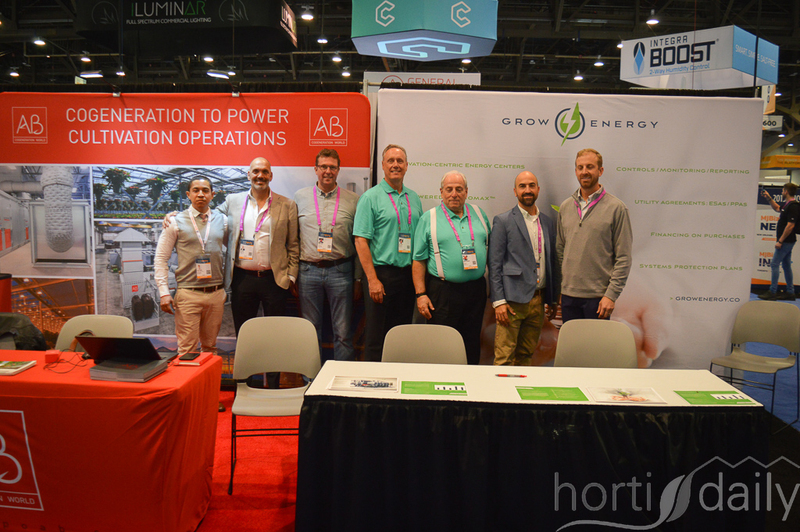 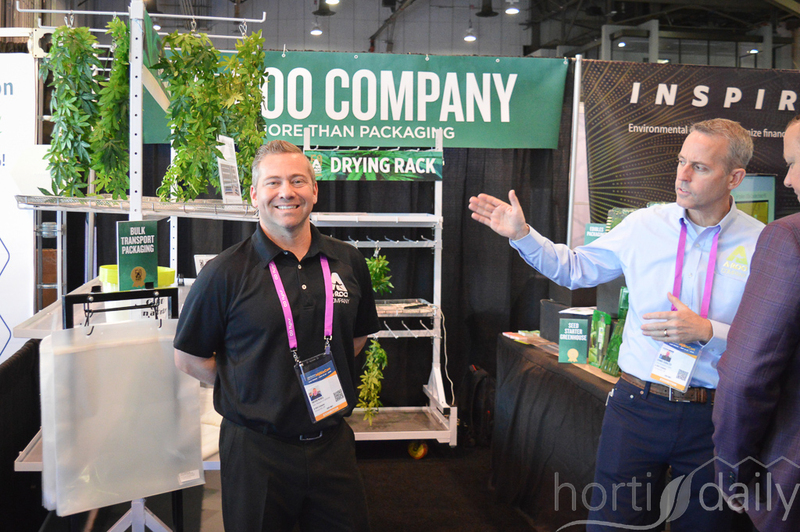 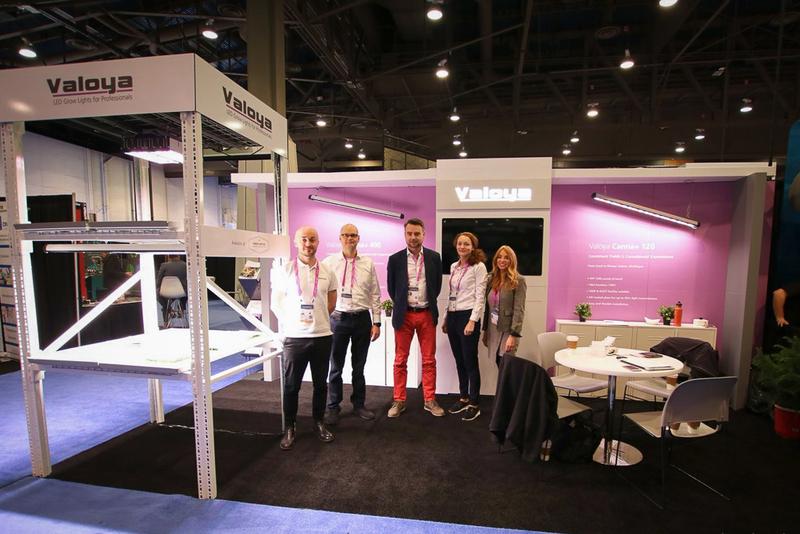 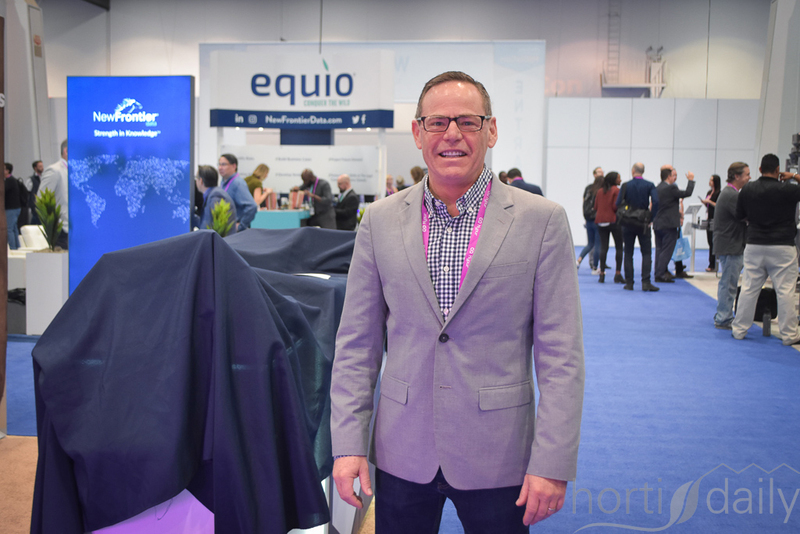 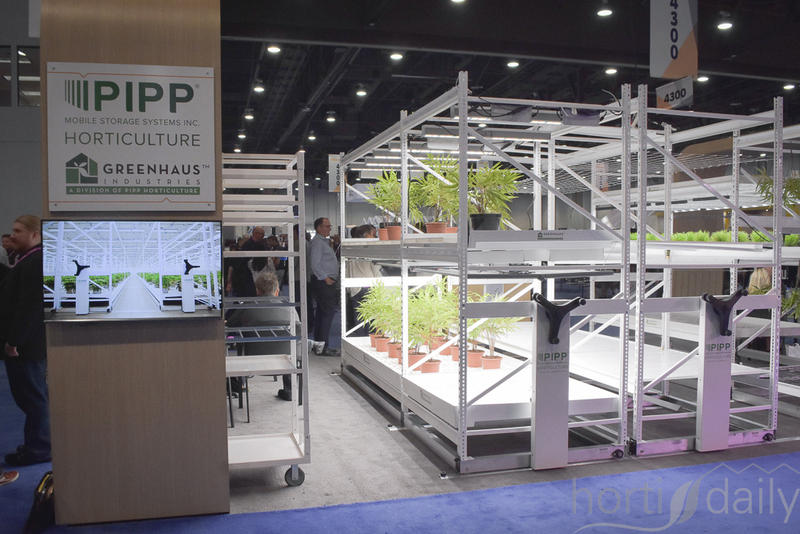 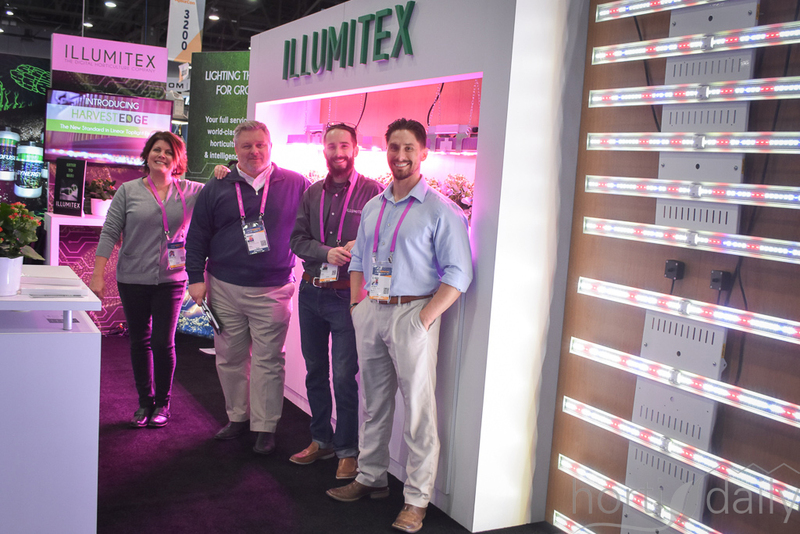 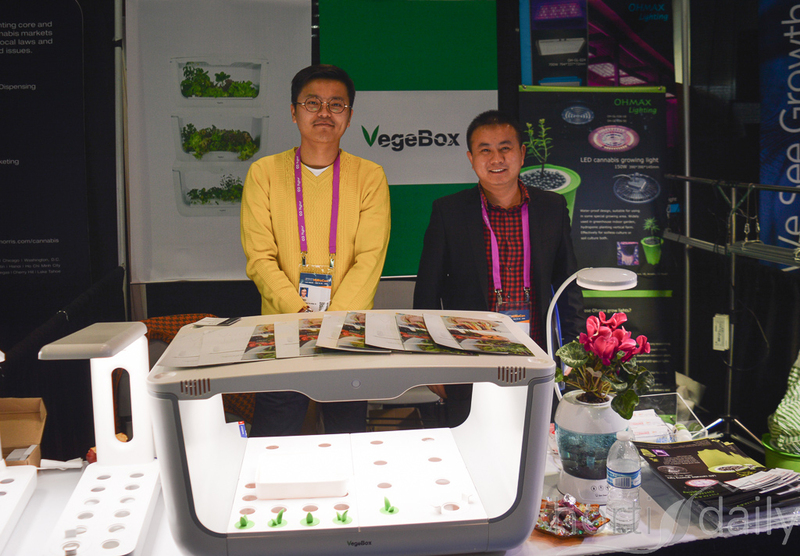 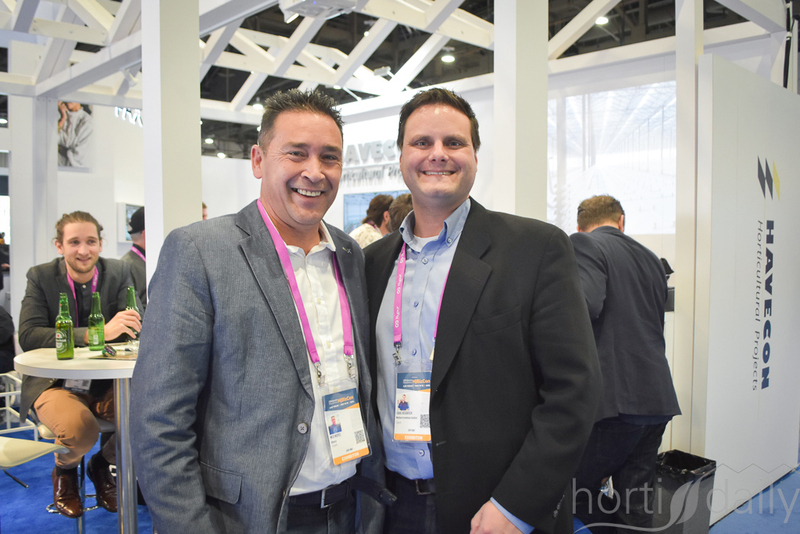 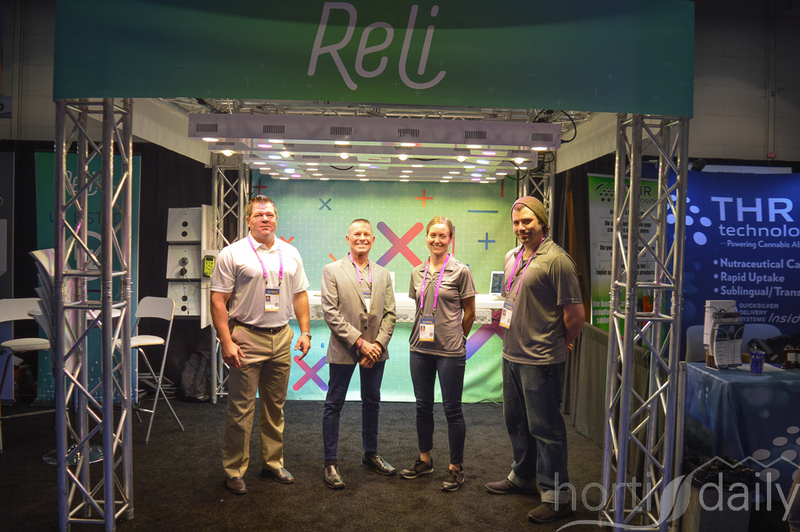 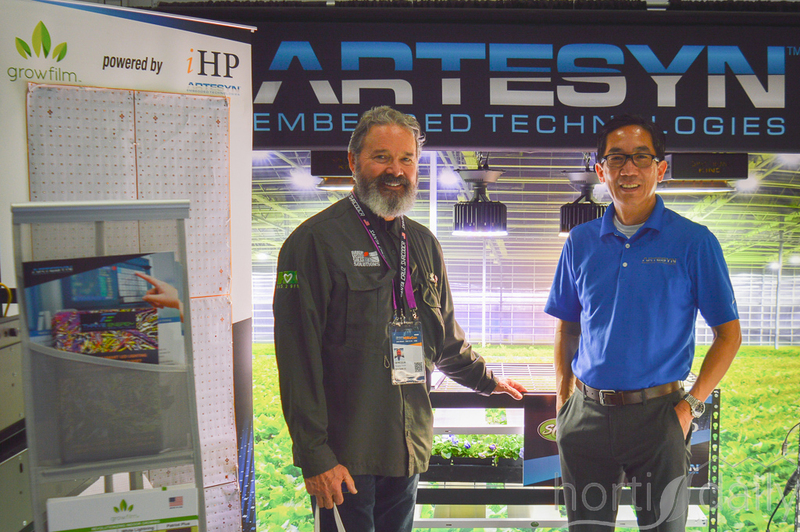 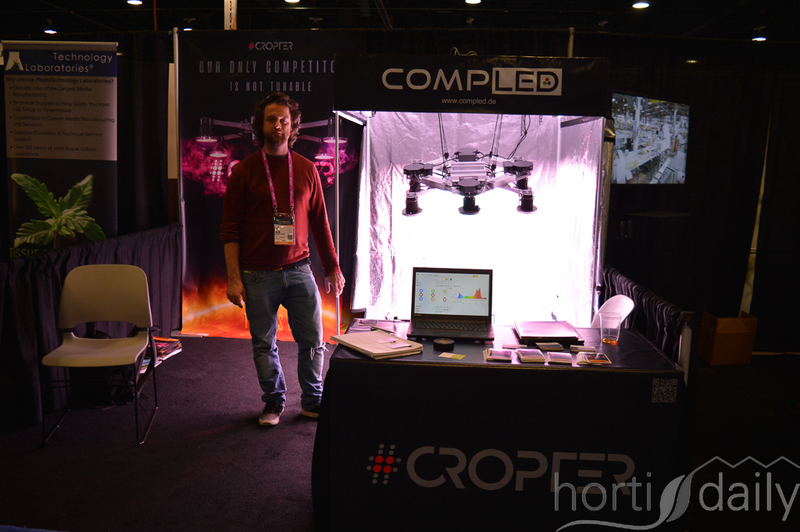 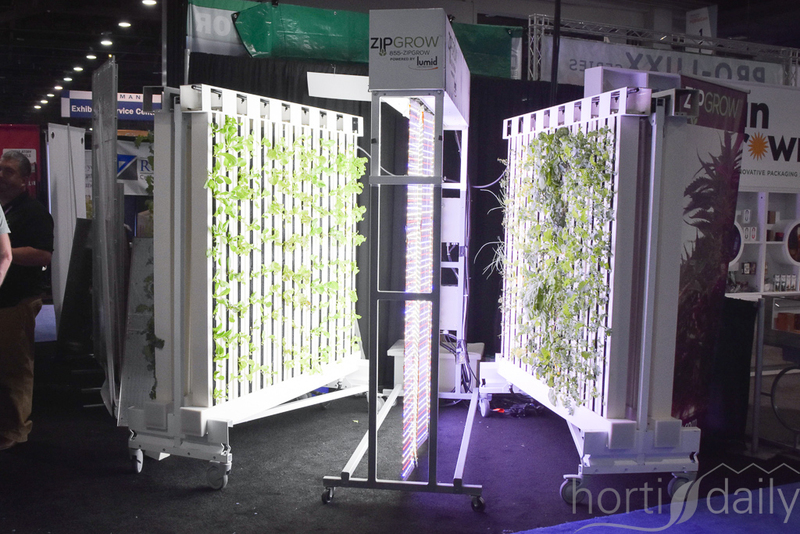 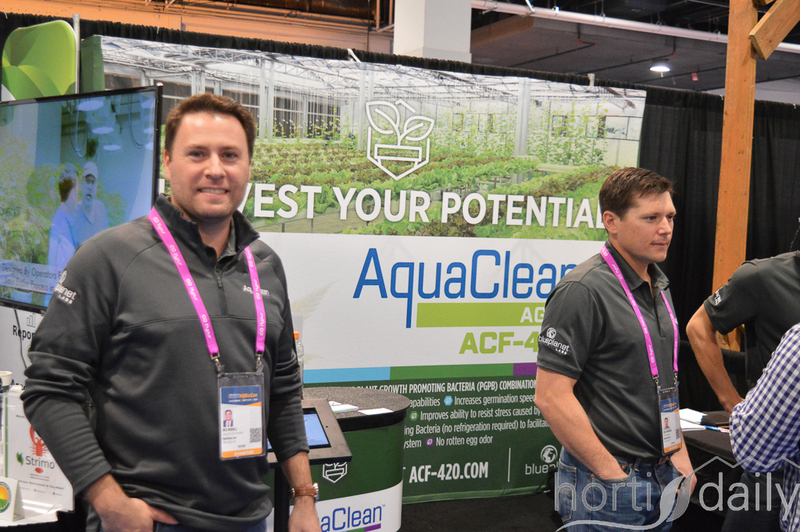 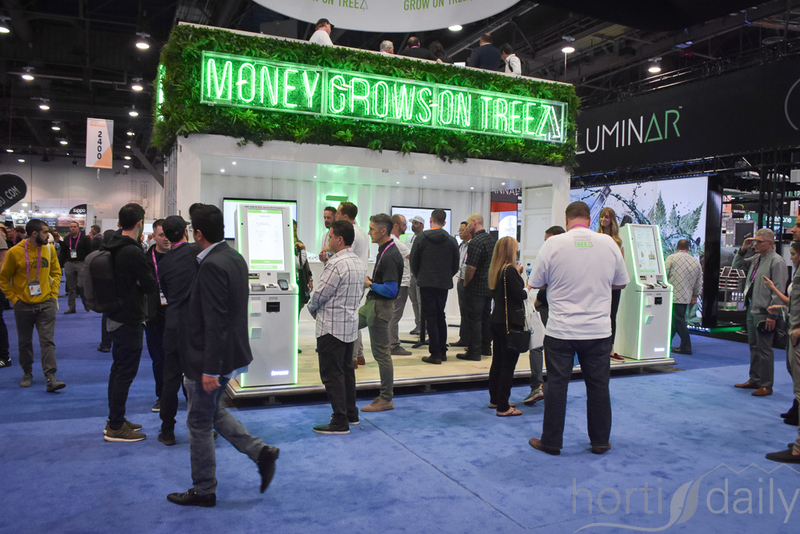 The company partnered up with Montel Inc. and showed the options of their LED-solutions within vertical farming systems. 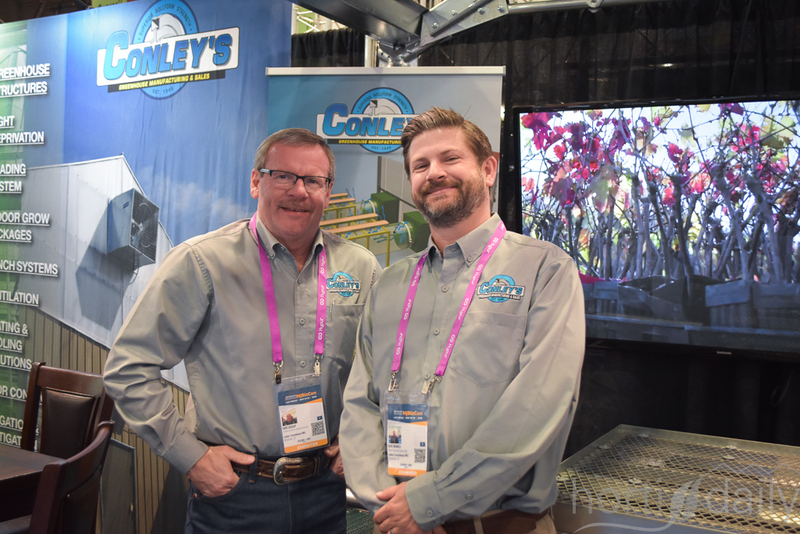 Dave & Dave (Bishop & Branca) showing the Conley's products & services. 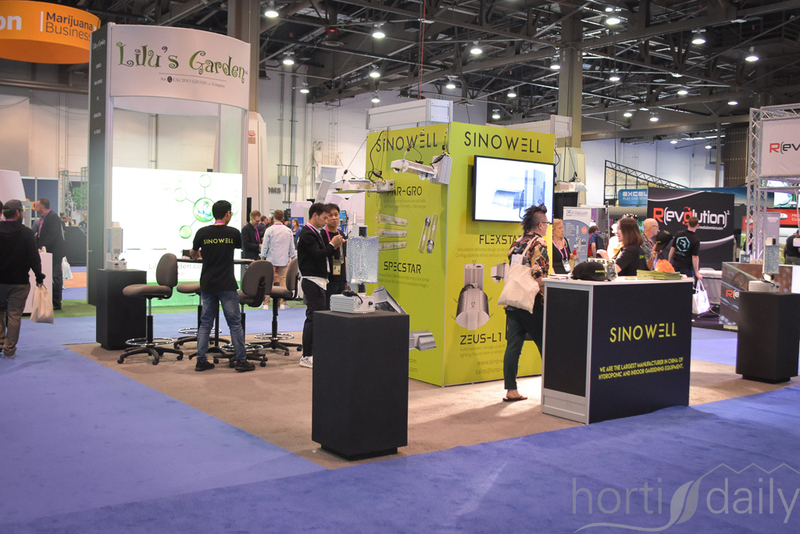 The Chinese company Sinowell specializes in hydroponic equipment and needs. 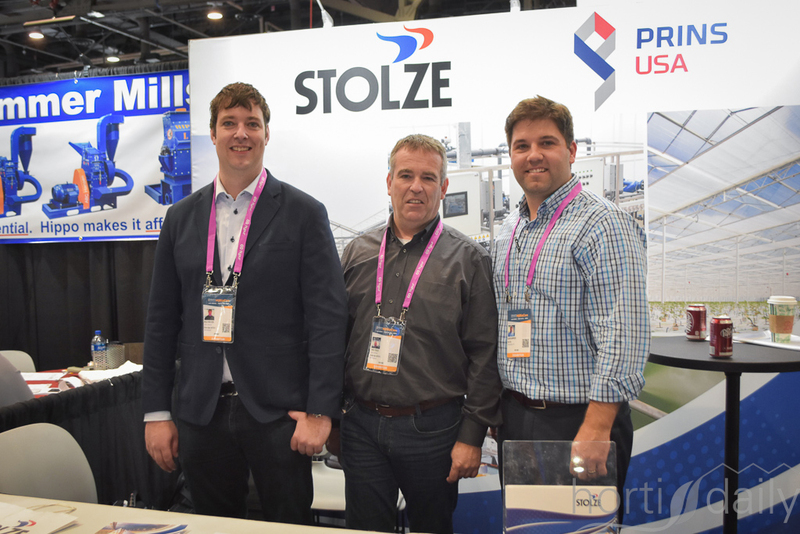 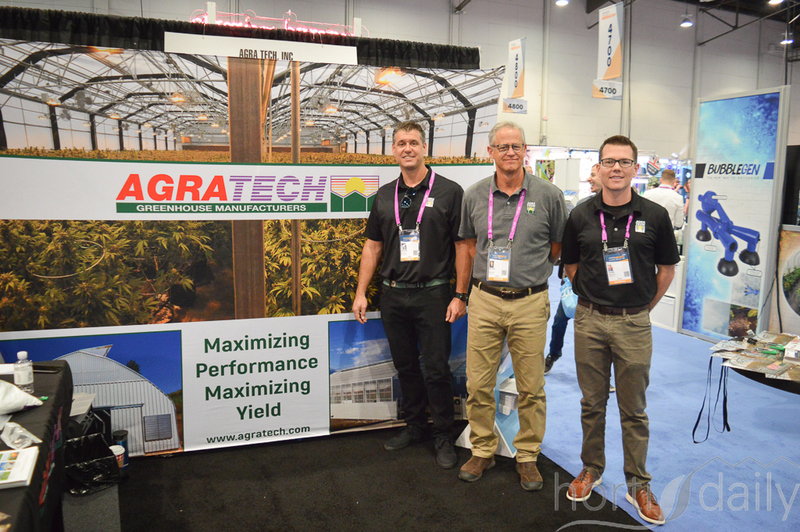 Jelle Boeters and Theo Stolze with Stolze Agro Int, sharing a booth with Jason Kamphuis with Prins USA and unitedly offering turn-key solutions to the industry. 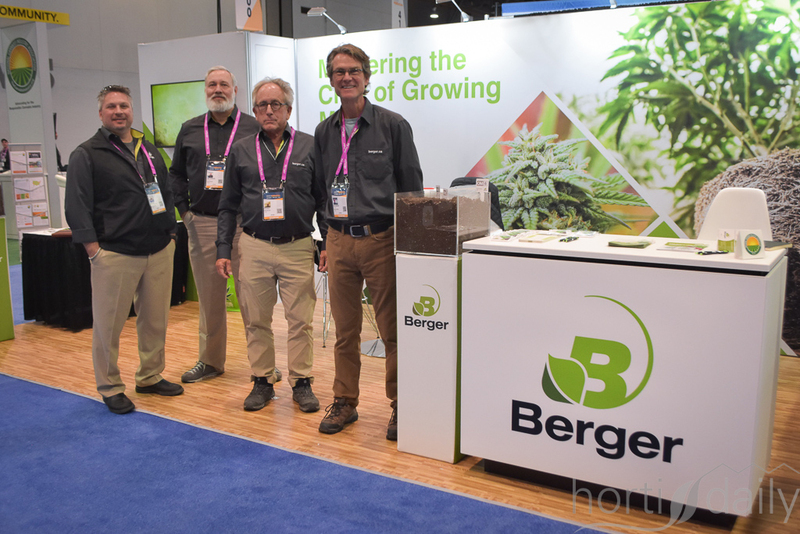 Kevin Staso, Derek Schumacher, Peter Hesse & Mike Hennequin with Berger, supplier of growing media. 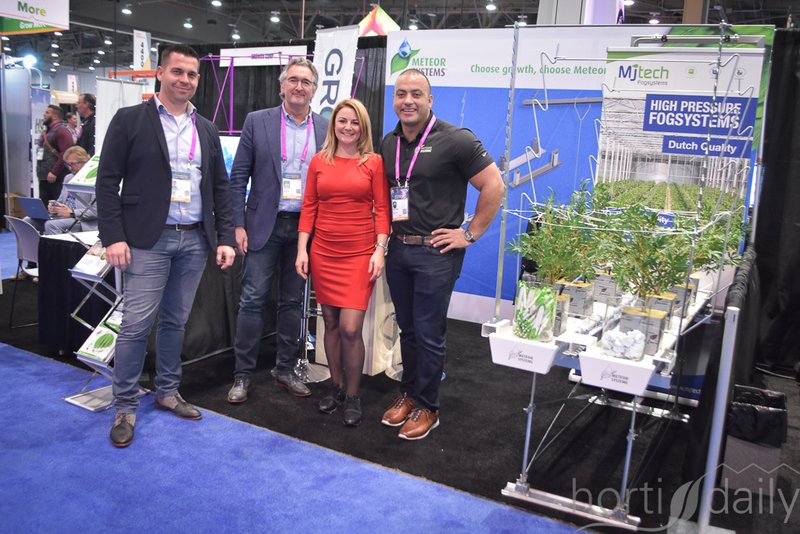 Ruud van Aperen with MJ Tech joined forces with Peter Lexmond, Laura Rastovac & Freddy Sarkis of Meteor Systems. 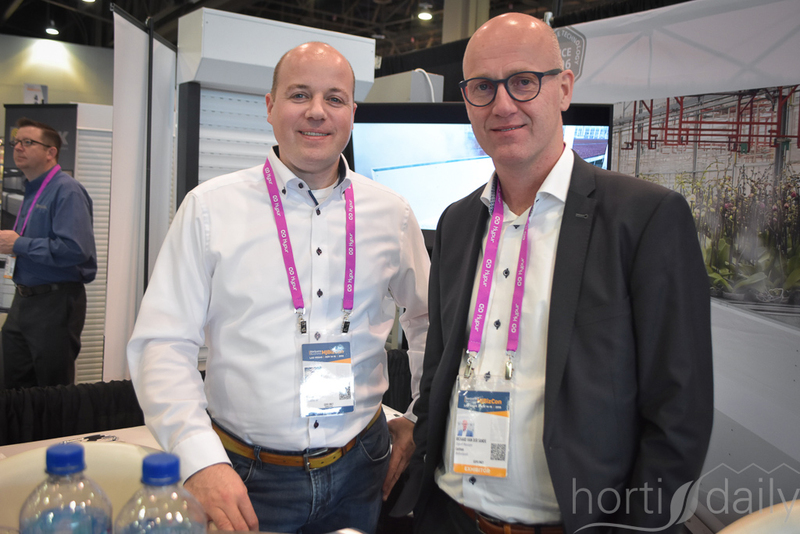 Marcel Schulte with Holland Netting International & Pascal den Heijer with Holland Screens International. 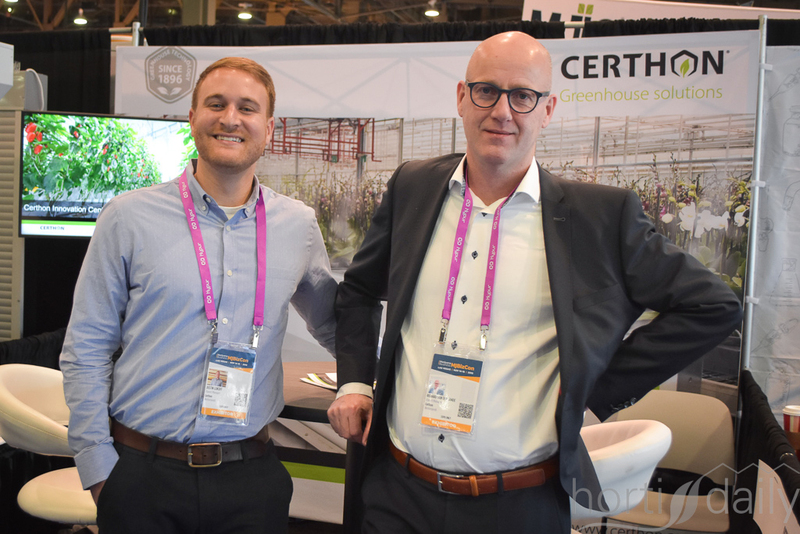 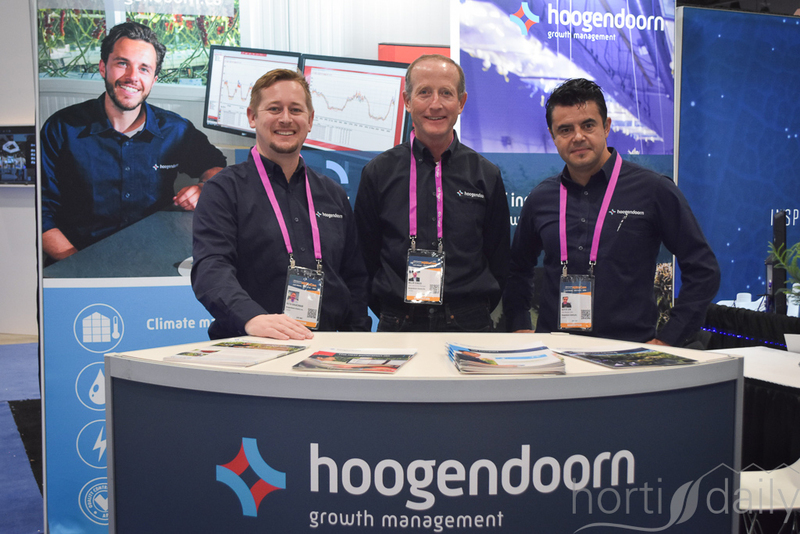 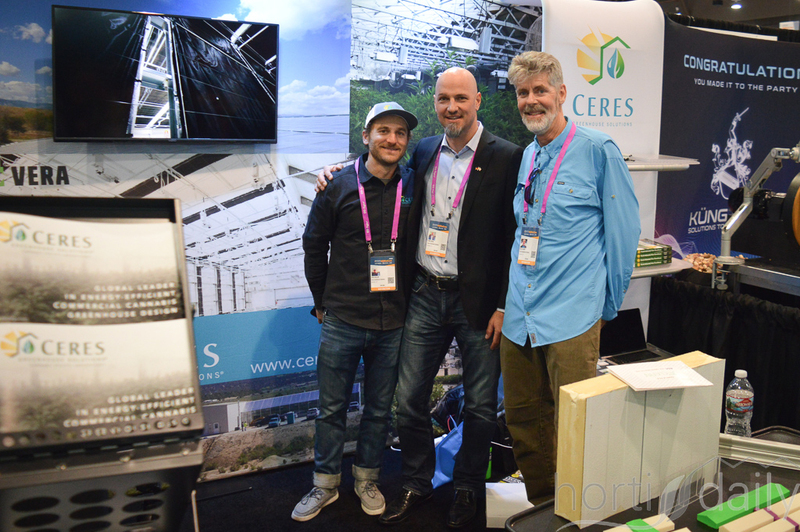 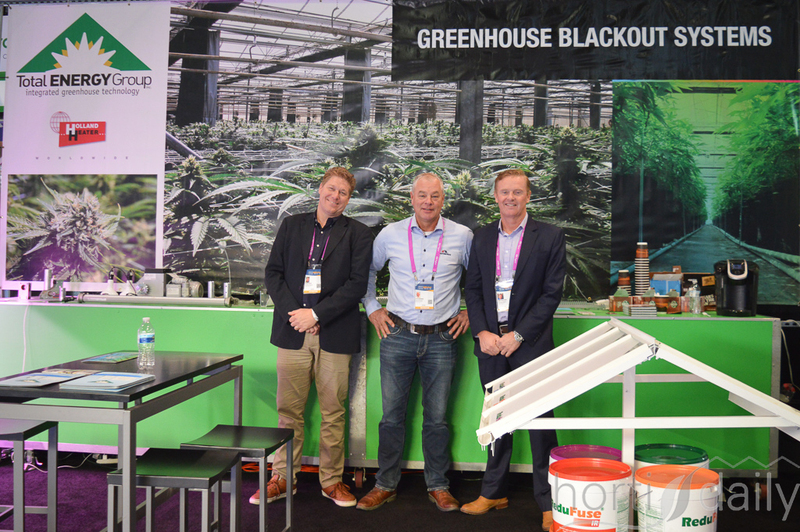 Michiel van Spronssen with Glascom Tuinbouw & Antonio Gomez of Greenhouse Depot Inc.
Vincent van den Dool with T.C. 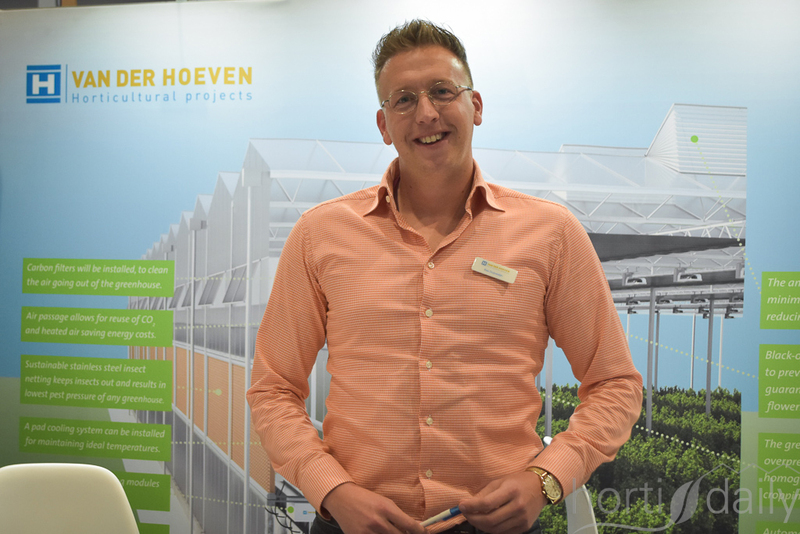 van den Dool. 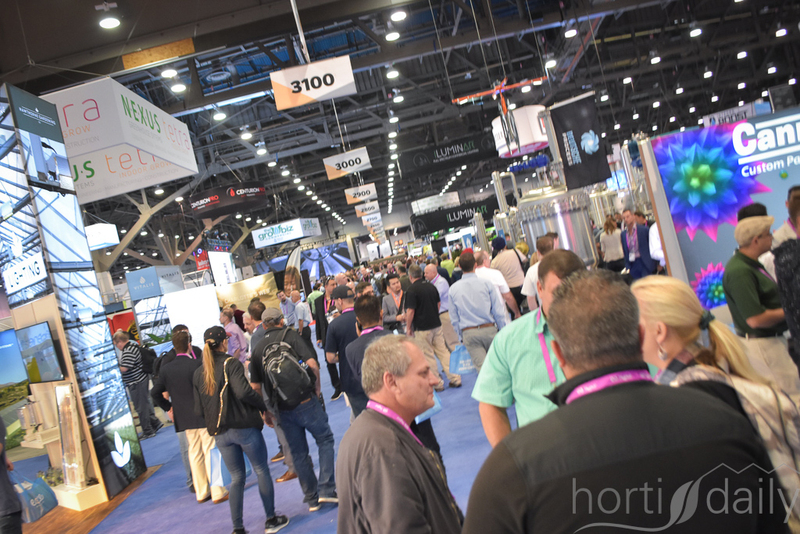 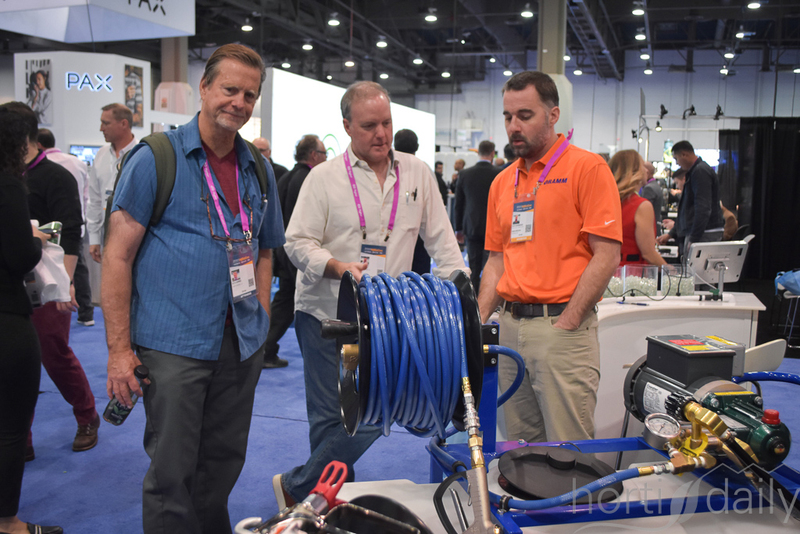 When taking a look at our pictures it might seem like a regular horticultural show, but walking around the exhibition floor you would run into visitors of all kinds. 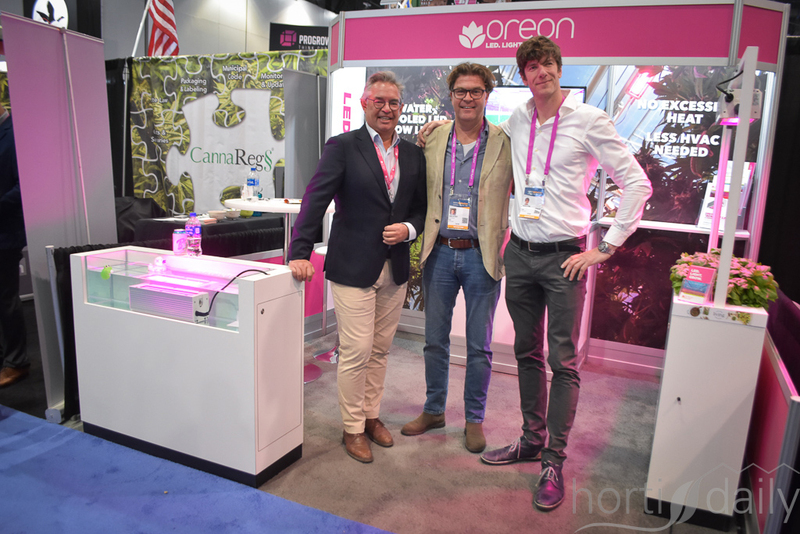 Jan Mol, Arnold de Kievit & Michiel de Jong with Oreon, also showing the new 400 Volt LED-fixture with an extended range. 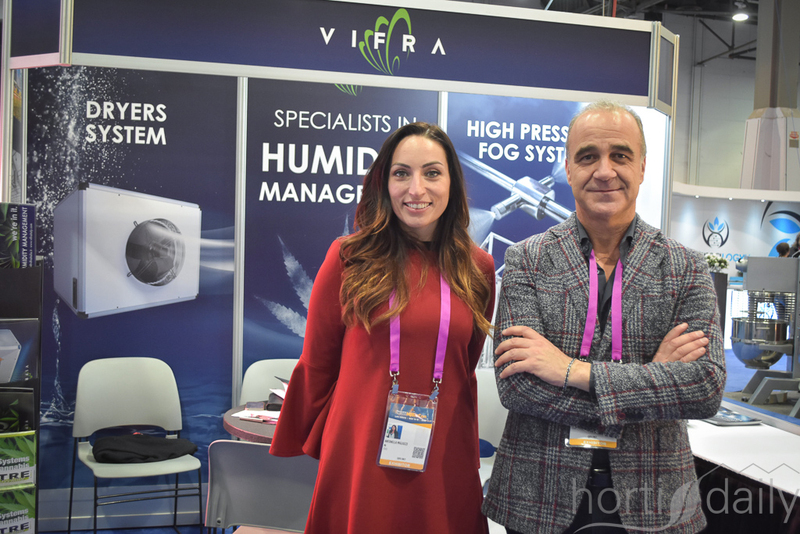 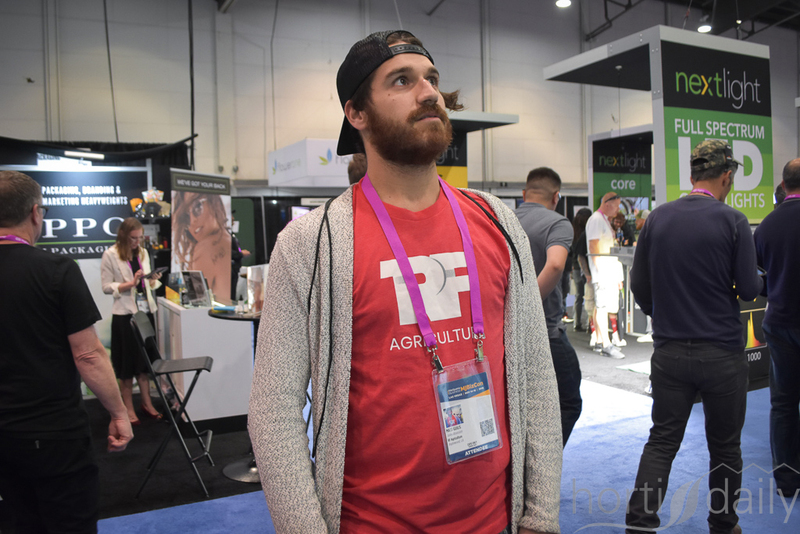 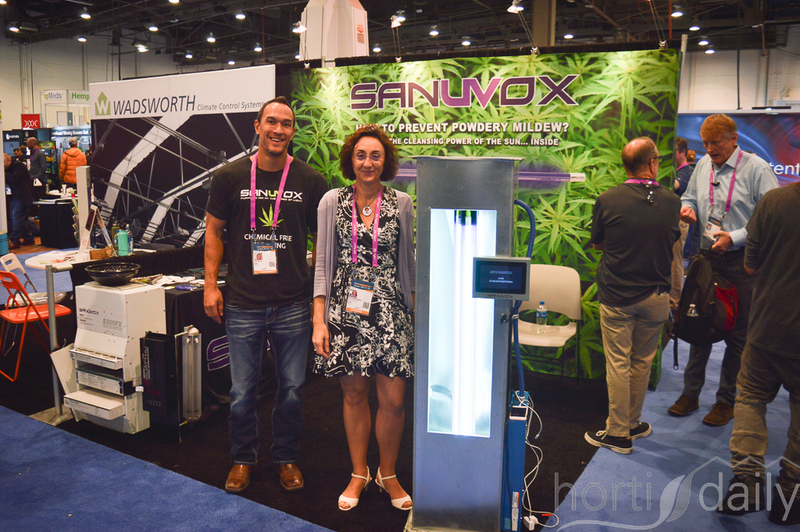 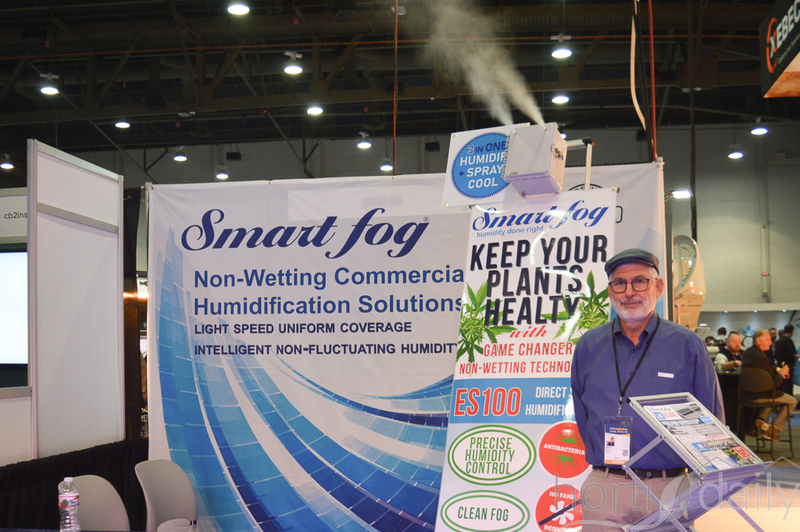 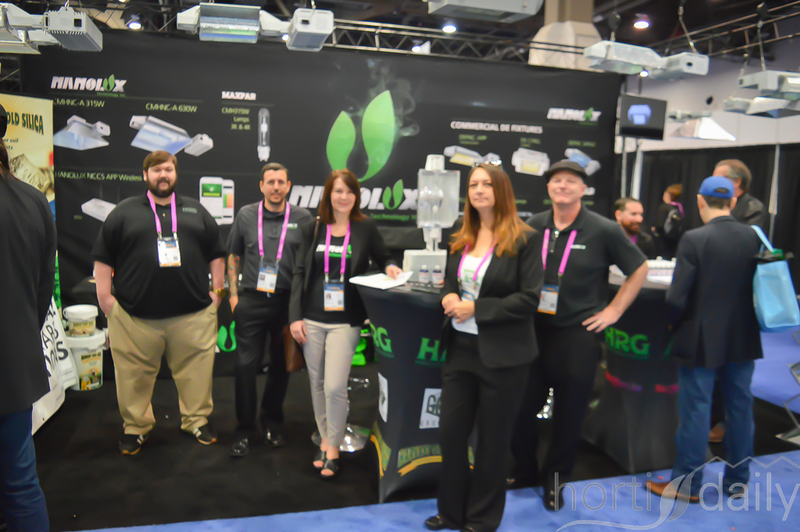 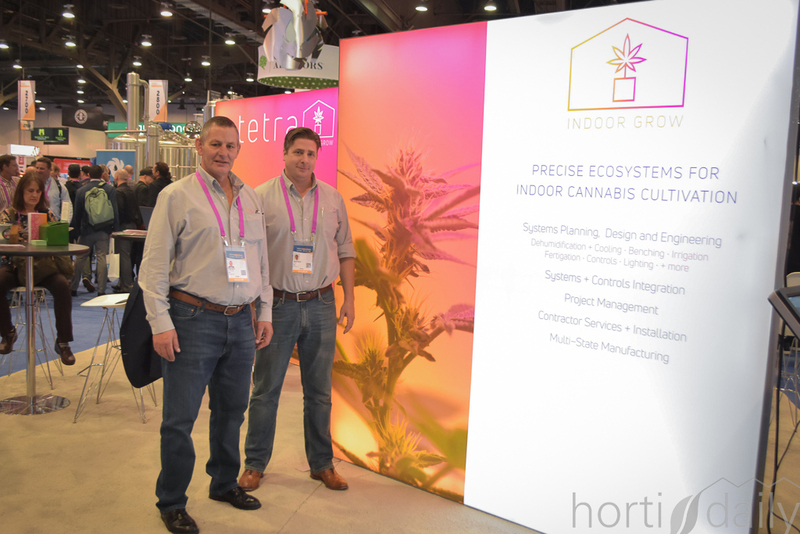 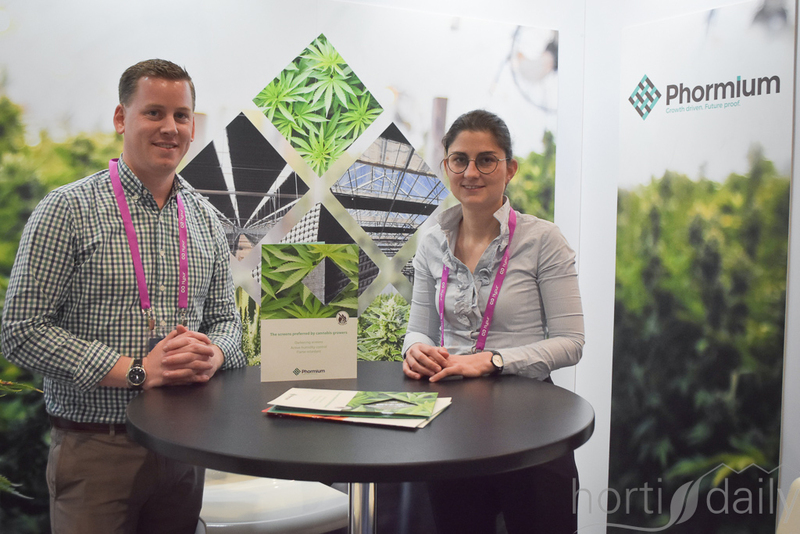 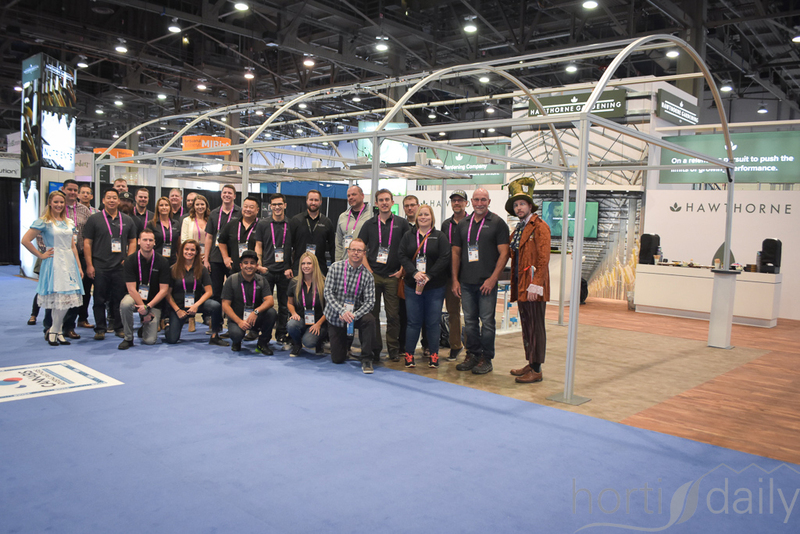 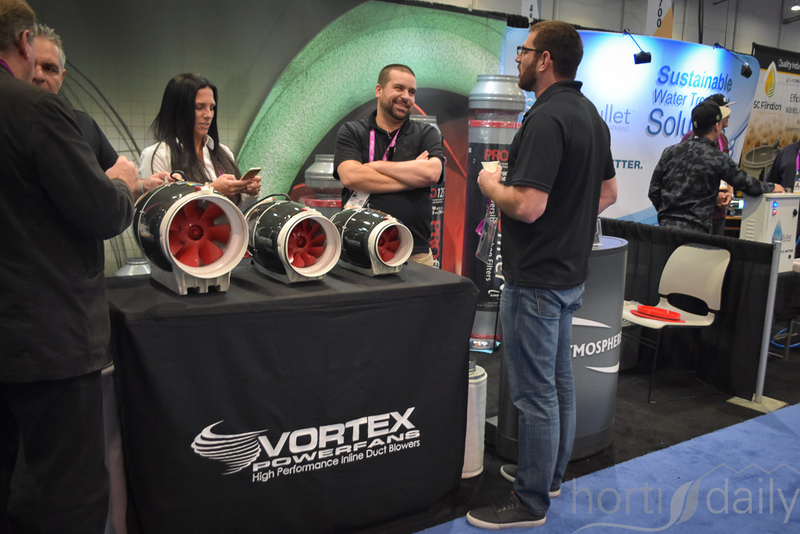 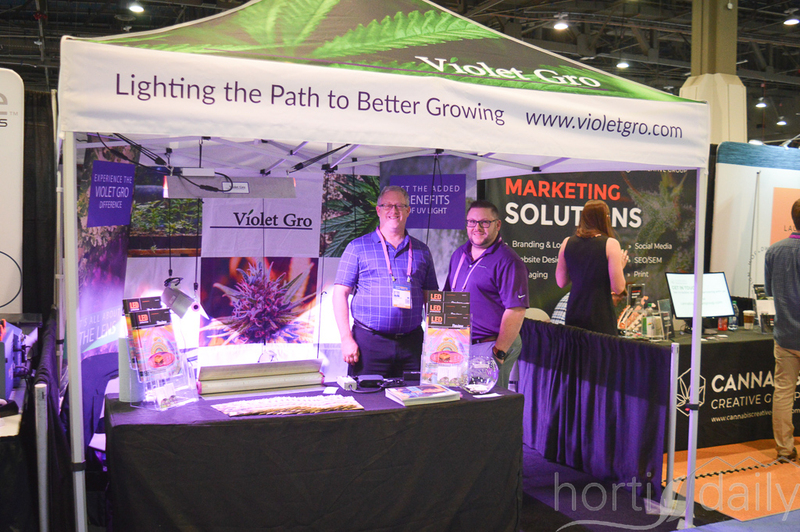 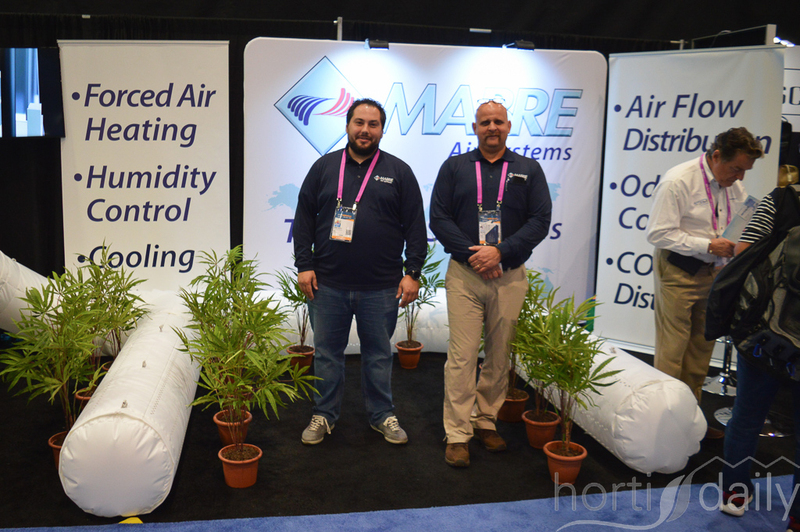 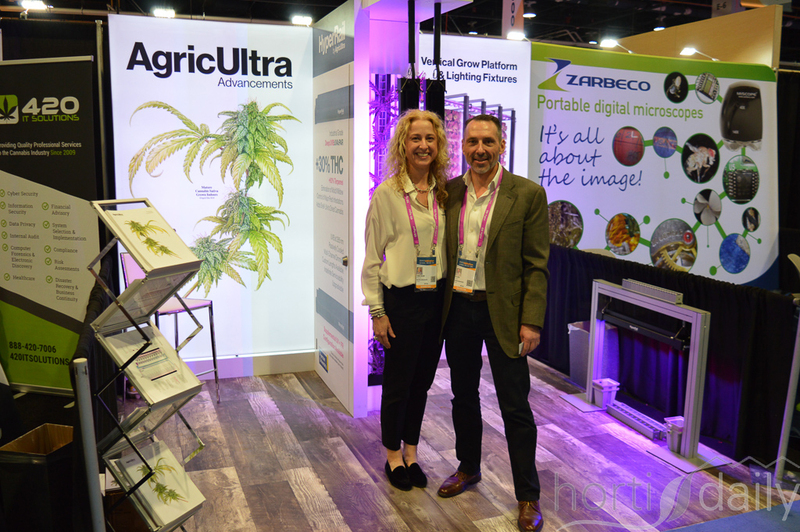 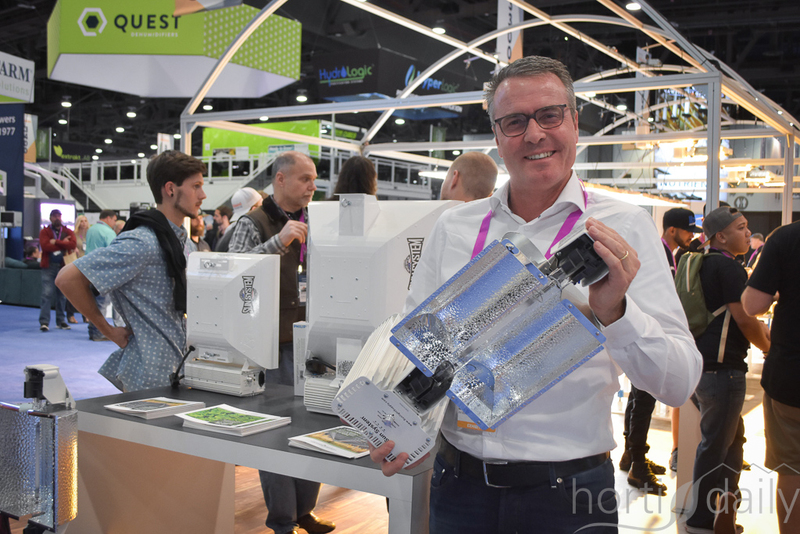 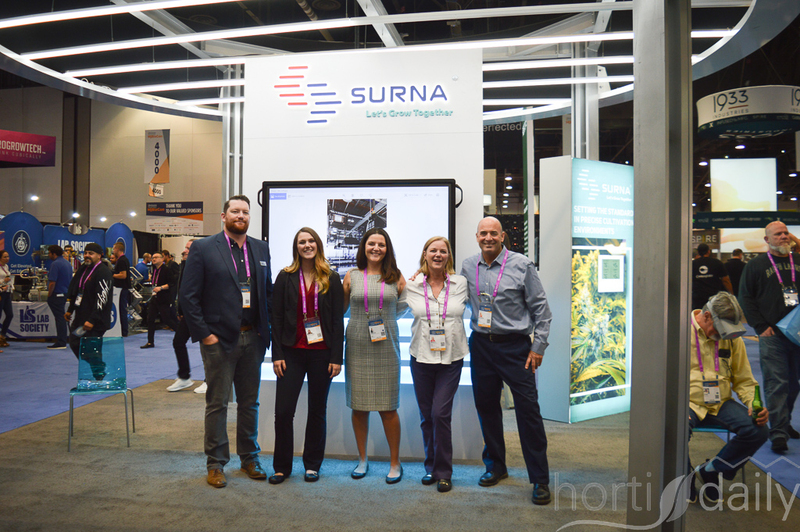 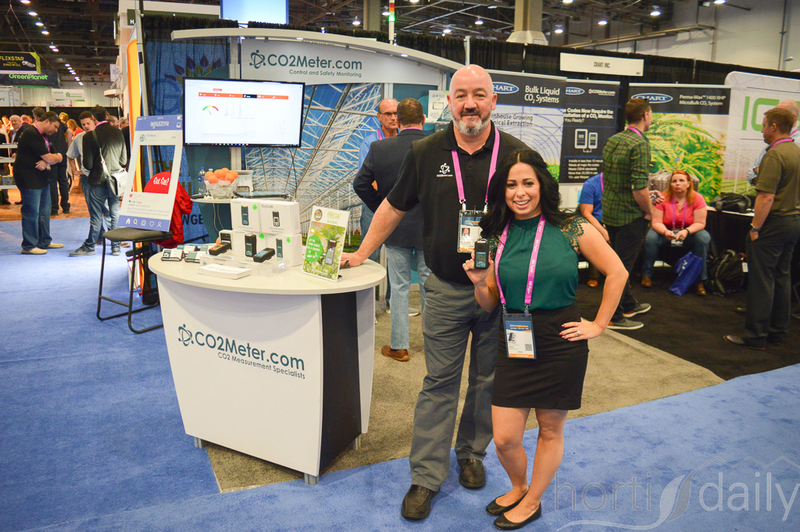 Vincenzo Russo and Antonella Migliozzi of Vifra joined in to explain more about the high pressure fog systems, an important tool for cannabis growers. 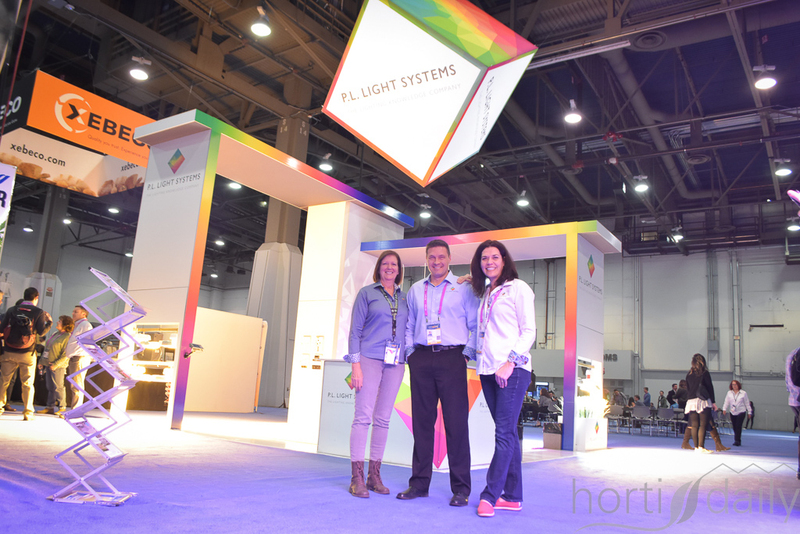 The booth of PL Light Systems was not to be missed. 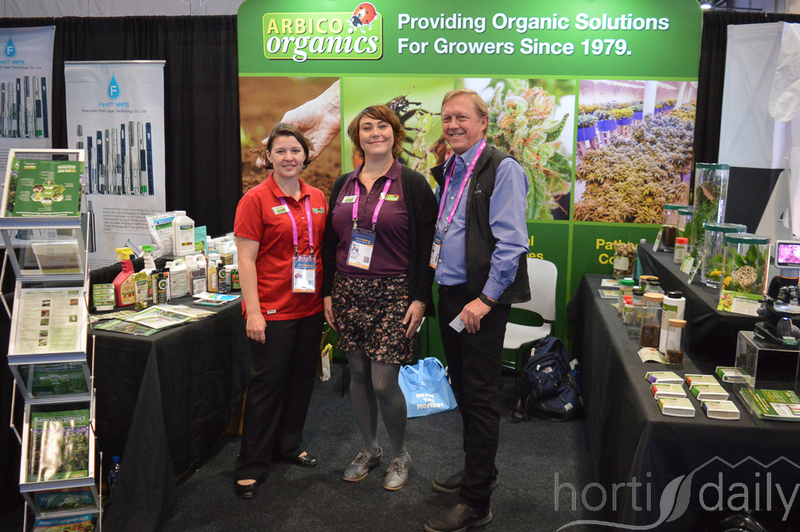 In the photo Lisa Jansen van Rensburg, Steven Szewczyk & Christine Stein. 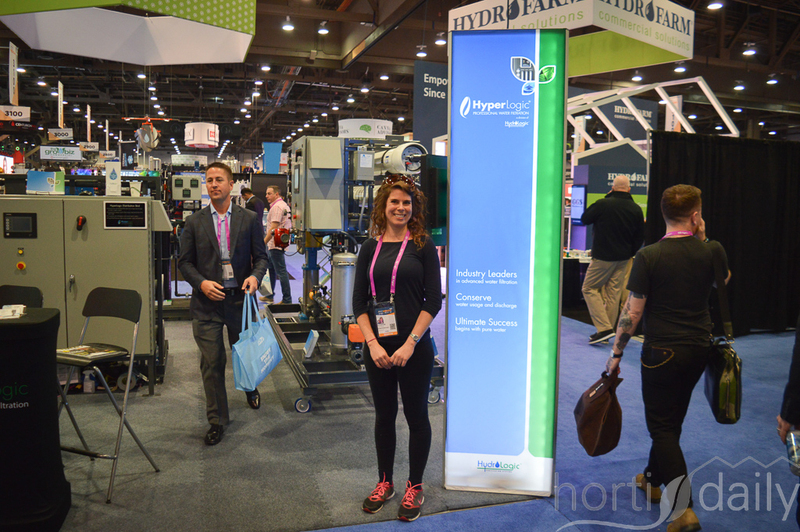 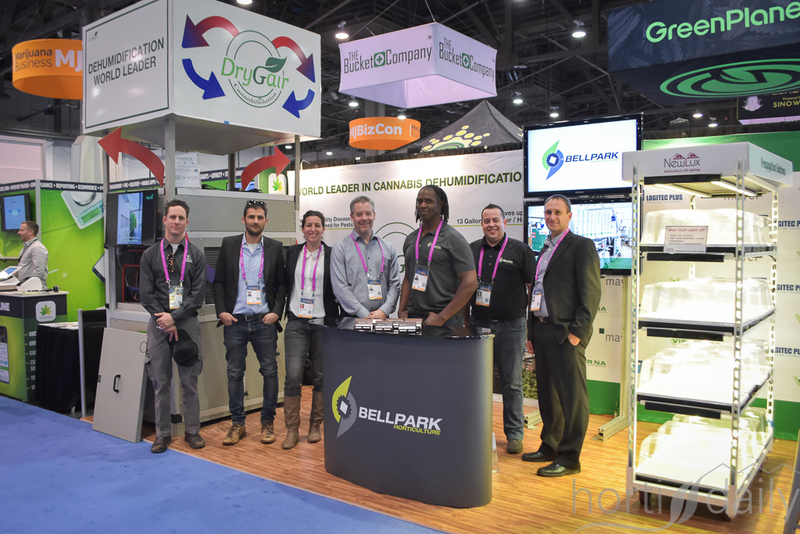 Bellpark Horticulture, offering horticultural & automation solutions, teamed up with DryGair, offering dehumidification systems. 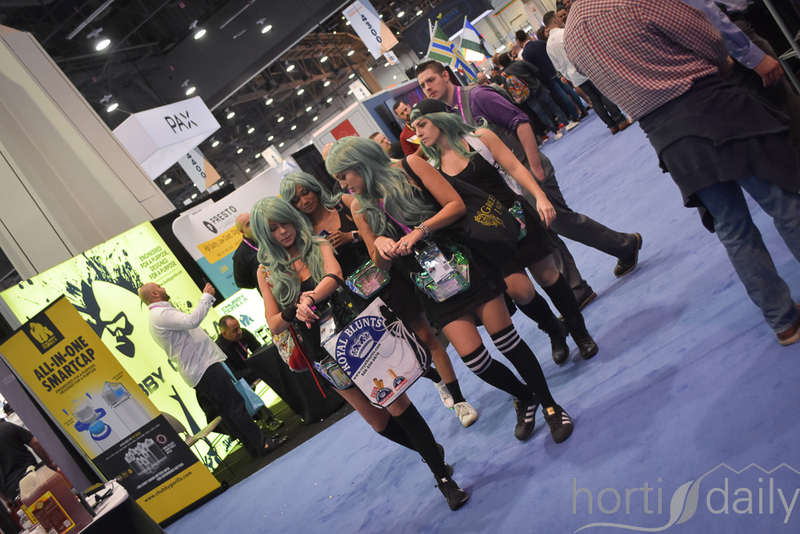 Colours & games on the show. 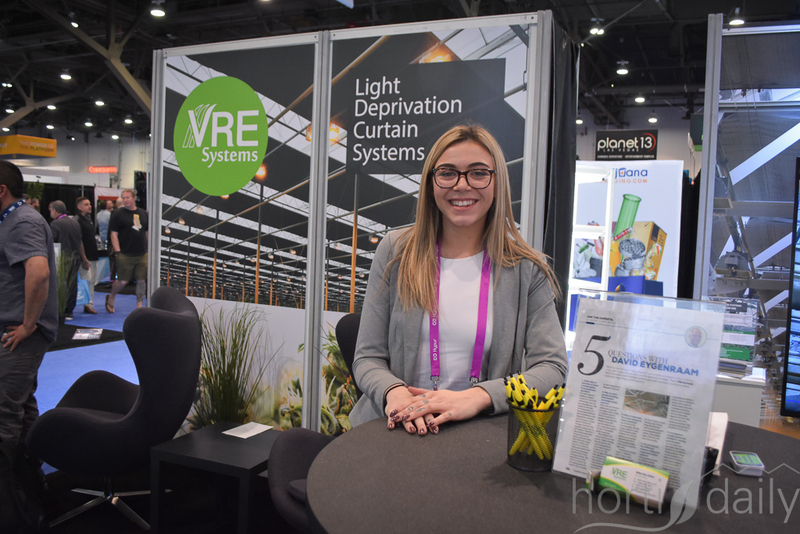 Shannon Lima with VRE Systems. 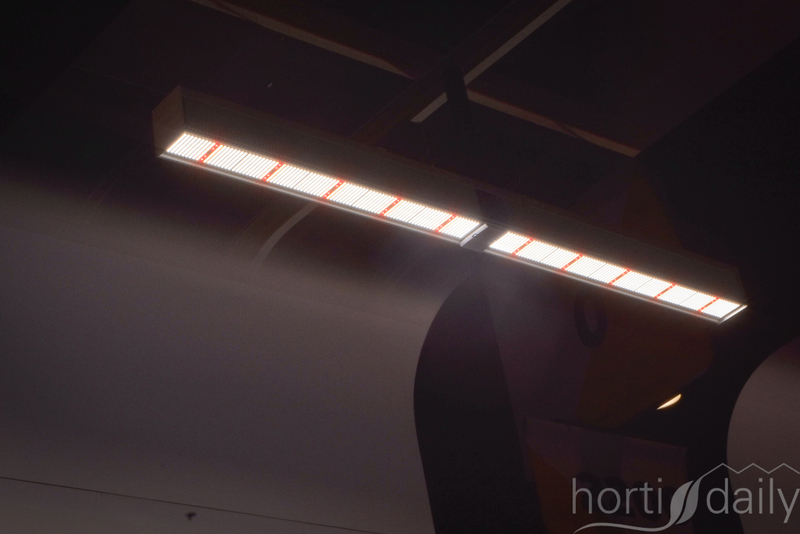 Phormium launched the new screen Eclips Dry. 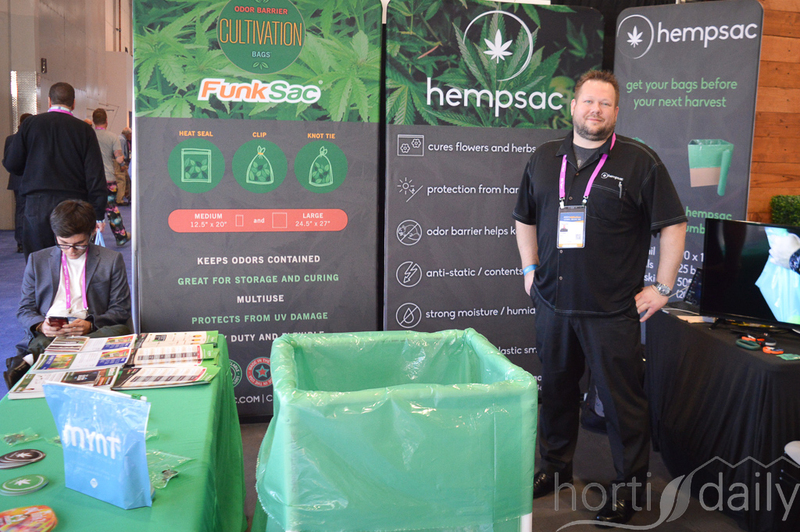 Since humidity is crucial in the cannabis crop, the two cloths are completely waved together to create one bundle - being beneficial to the humidity since it offers more contact points and therefor avoids condensation. 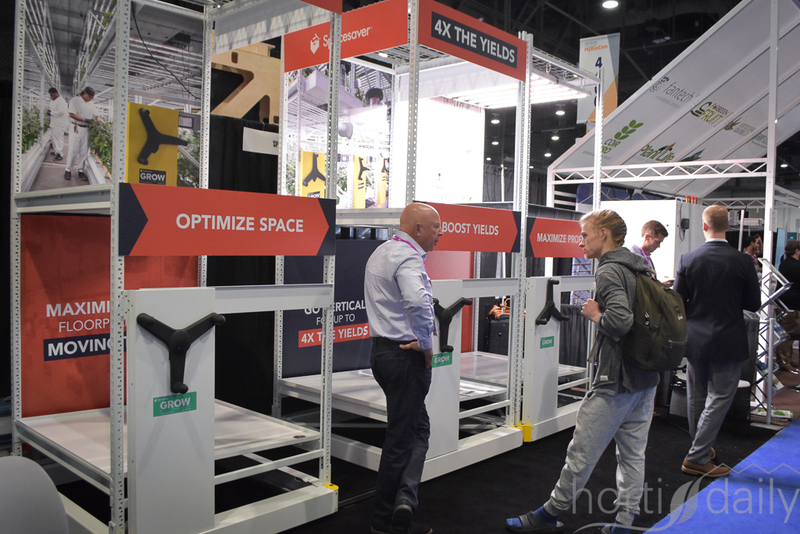 Optimising space - one of the steps to be taken in optimising your operation. 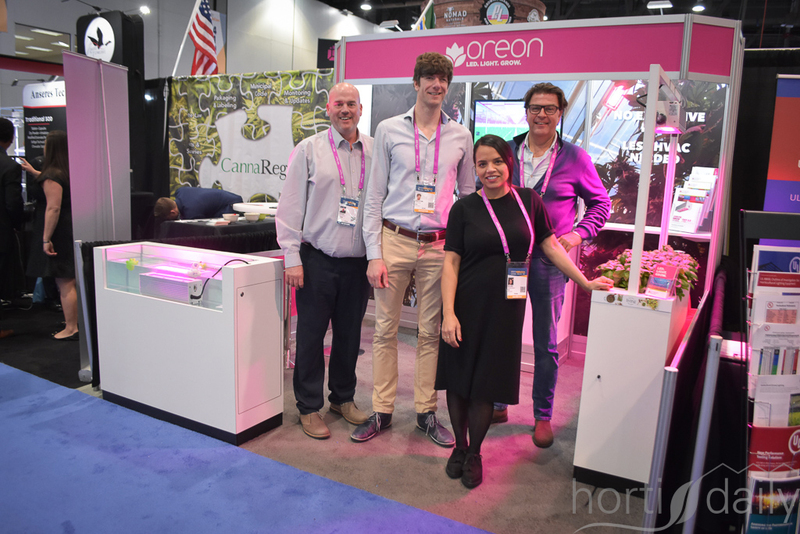 Jason Beer joined his Oreon colleagues. 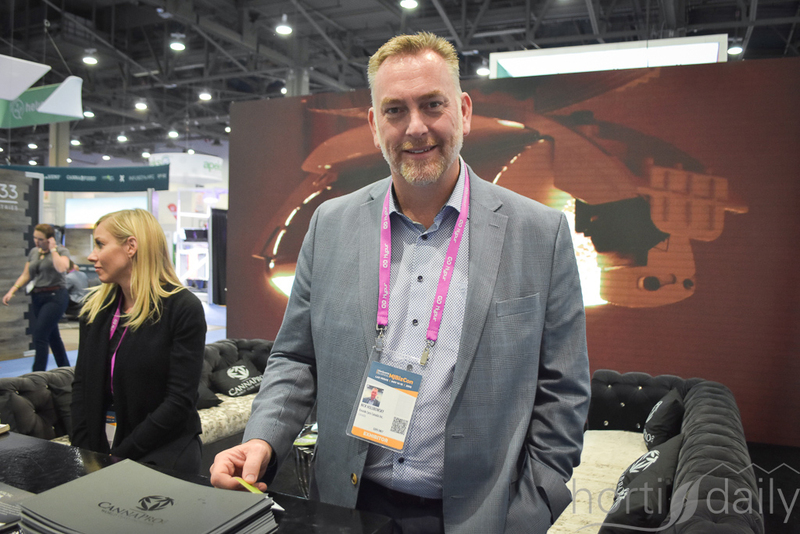 Simon Martin with Gobell Dion & Associates. 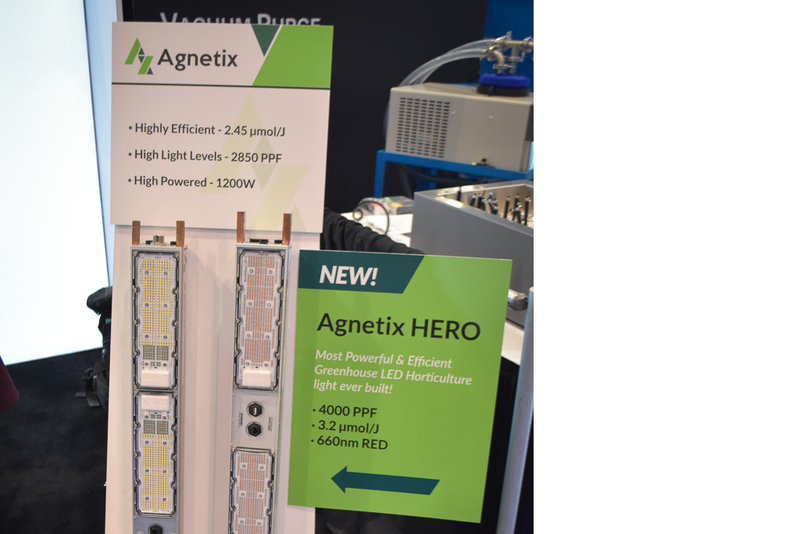 Agnetix launched their new water-cooled LED. 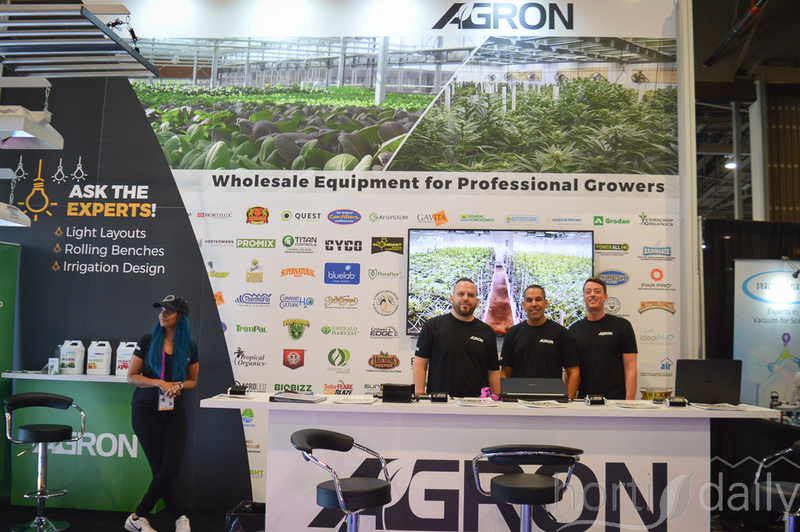 Shown by Troy Robson, Ihor Lys, Jordan Miles, Cristina Rodrigues & Nick Pefzel.